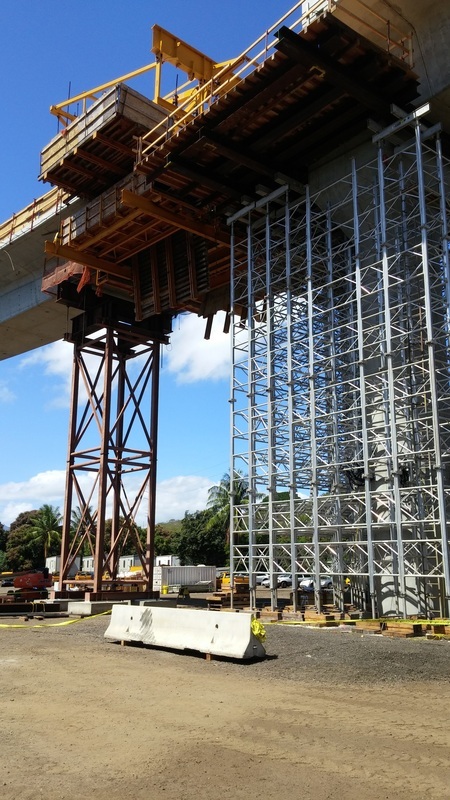 Dedicated to providing quality engineering services to the heavy construction industry, SMG has experience in all aspects of temporary structure design including falsework, shoring, cofferdams and trestles. 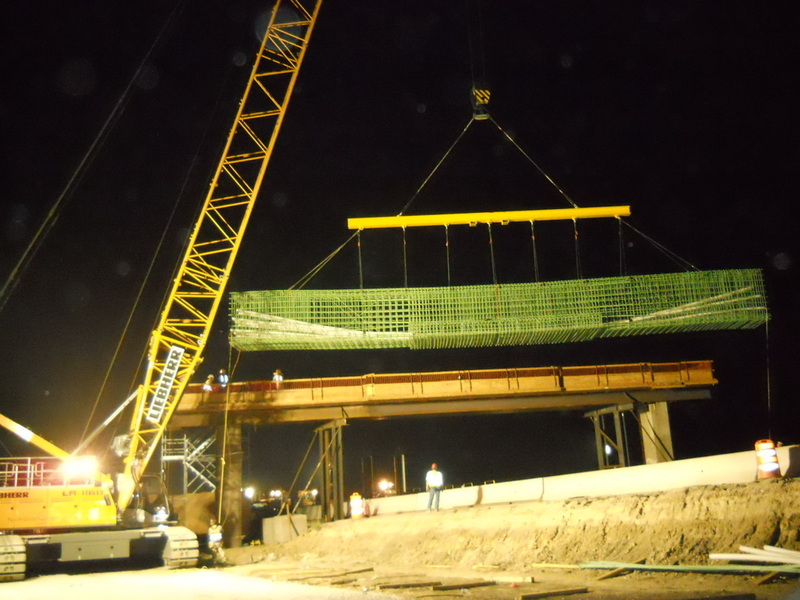 SMG understands the concerns and demands of the construction industry. 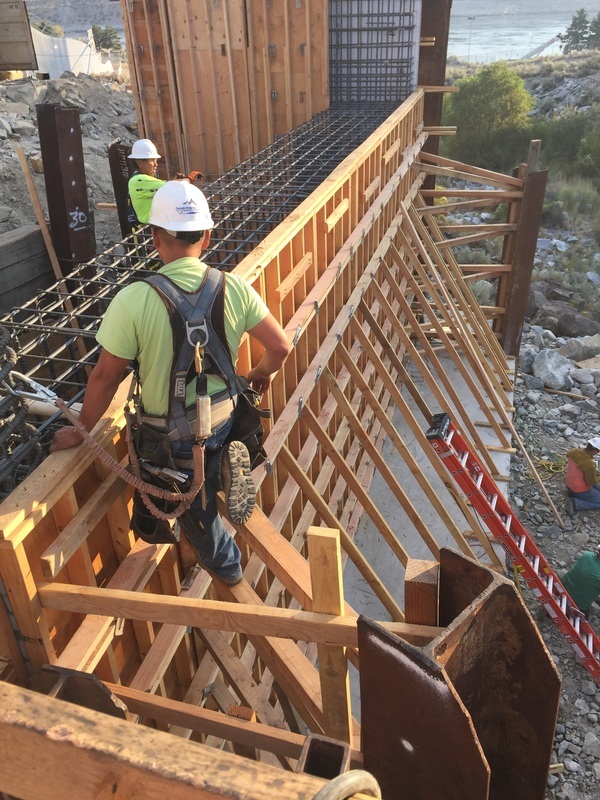 By addressing safety, economy, materials inventory and simplicity of design, SMG has developed an excellent reputation with contractors and owner review departments. 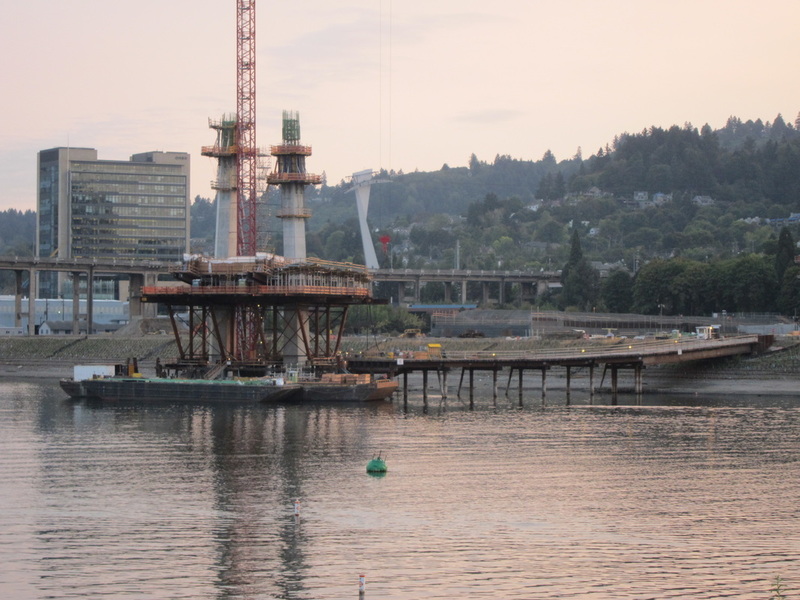 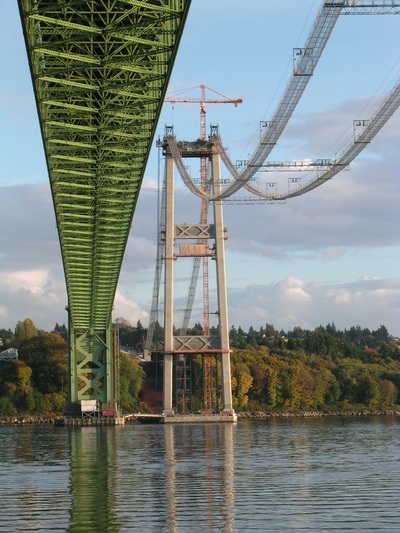 SMG provided construction engineering for Portland's first cable stayed bridge. 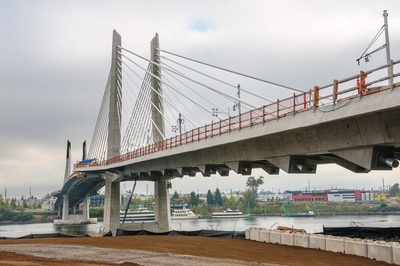 This bridge over the Willamette River is open to light rail trains, buses, bicycles and pedestrians only. Designs included access trestles that had spans up to 134-feet in order to stay clear of no disturbance zones. 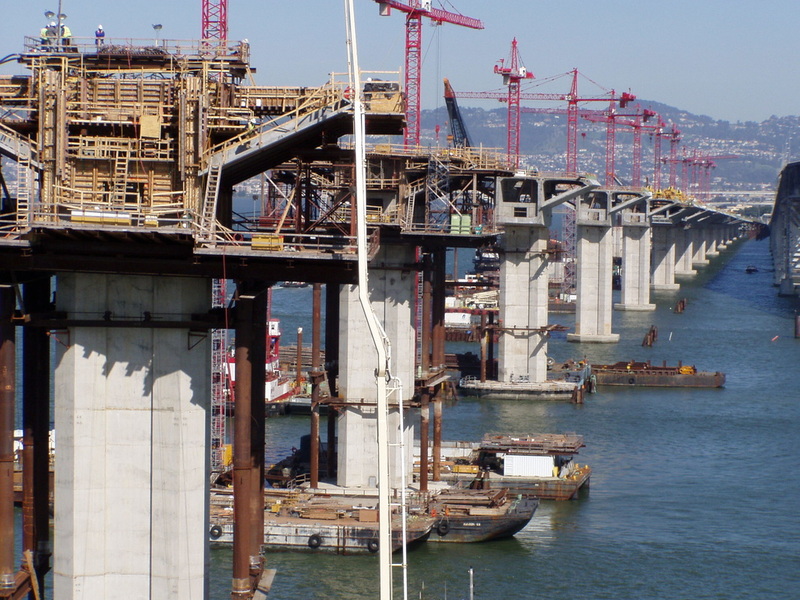 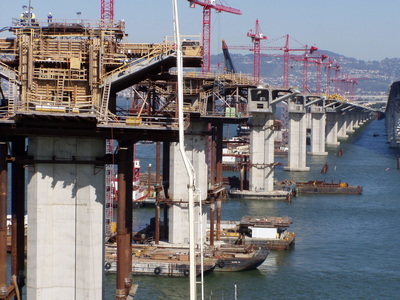 SMG also designed oscillator platforms, superstructure falsework at the pylons, main span closure falsework along with pylon rebar stability bracing and rebar support frames. 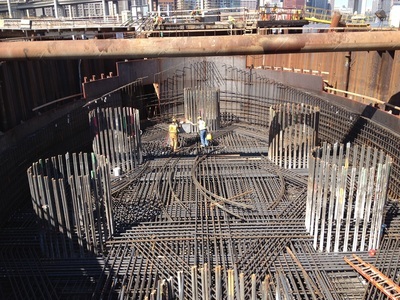 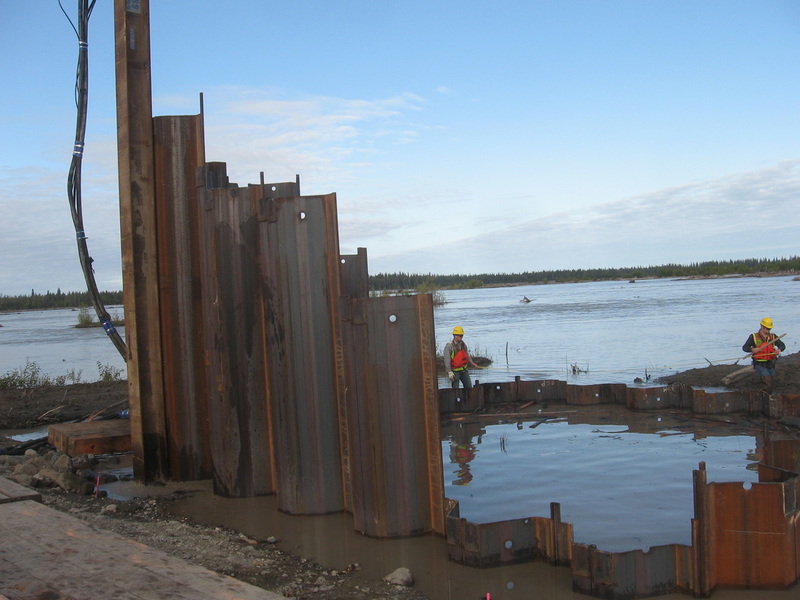 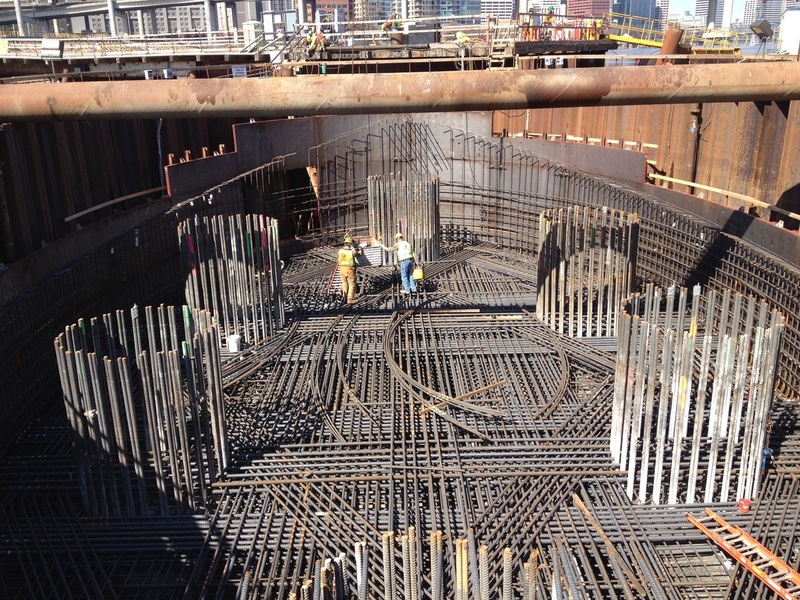 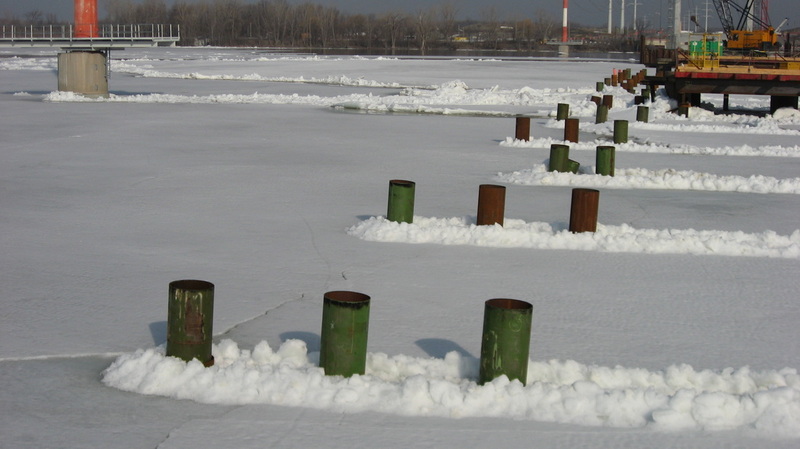 SMG also designed 300-foot-long by 40-foot-tall sheetpile cofferdams for pylon foundations. 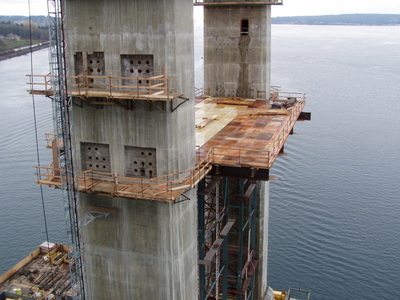 SMG provided engineering services for designing pier tables, top deck falsework, overhang falsework, dry cell foundations (which facilitates periodic tower crane anchorage inspections without the need for underwater dive services), tower crane foundations, lift plans, spreader beam capacity reviews, a repair procedure and sequencing of repair for pier columns, and designed falsework for the pier column and pier caps. 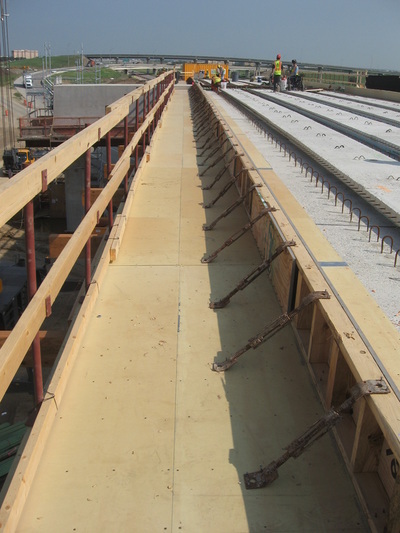 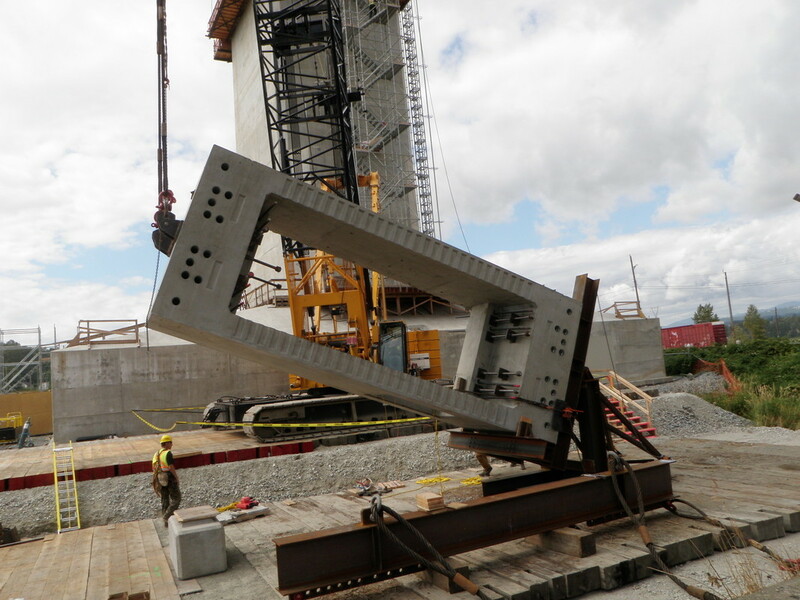 SMG provided engineering services for the new bridge abutment and wing wall formwork. 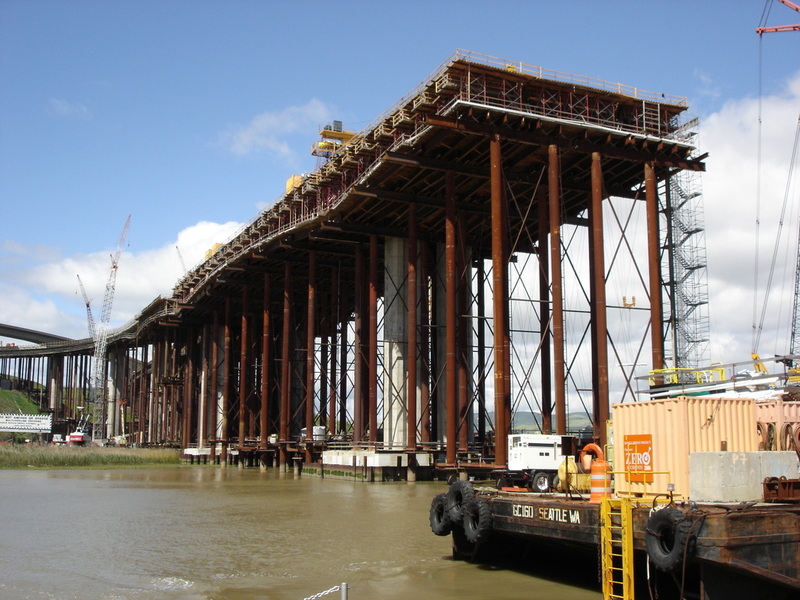 The forms were site-built using lightweight 2x members, and braced to already-completed sections of the permanent structure. 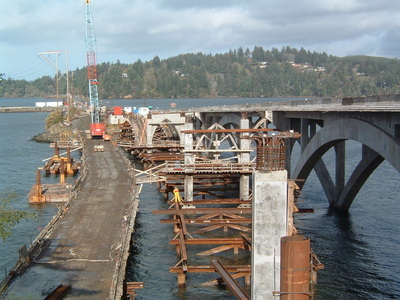 Engineering services were also provided for relocating an existing truss bridge to a new location beside the new span, which was temporarily used as a work bridge. 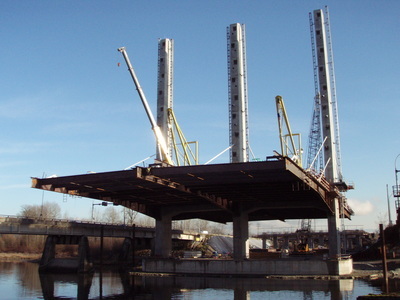 Work platforms for cranes and equipment at both ends of a temporary work bridge were also designed and were used for removal of the existing structure as well as construction of the new structure. Other services included a girder erection sequence, associated work bridges and temporary girder bracing. 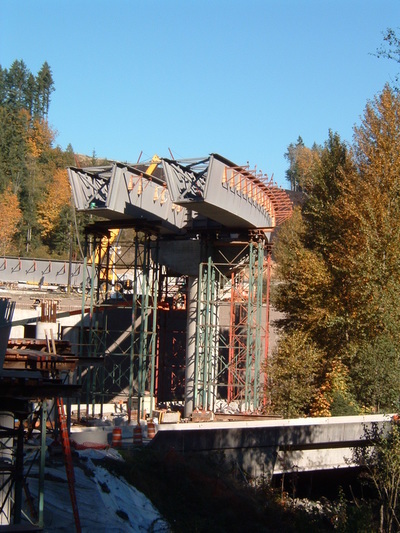 The pre-stressed concrete girders were temporarily supported on SMG-designed work bridges that also functioned as a crane trestles. 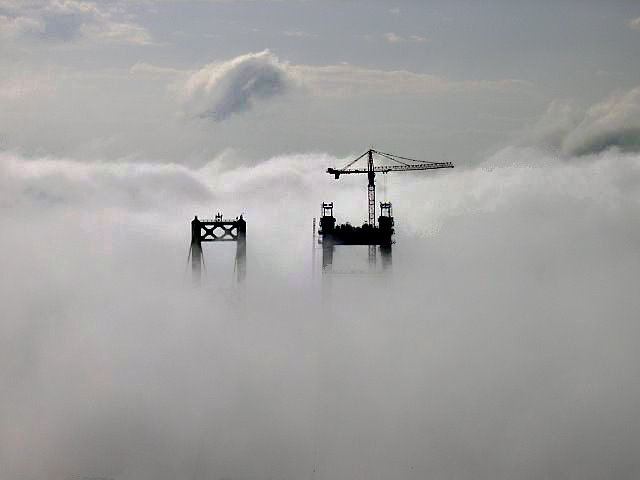 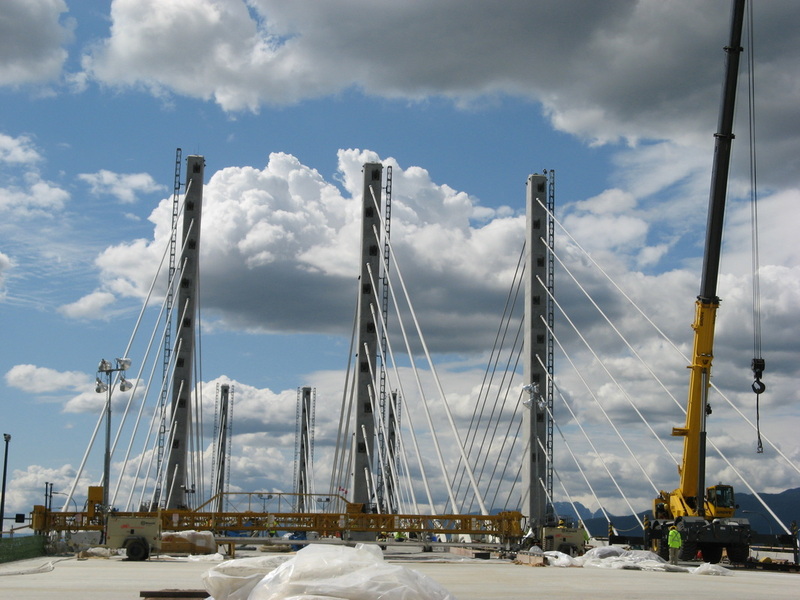 SMG provided construction engineering services for the new Port Mann cable-stayed bridge in BC, Canada. 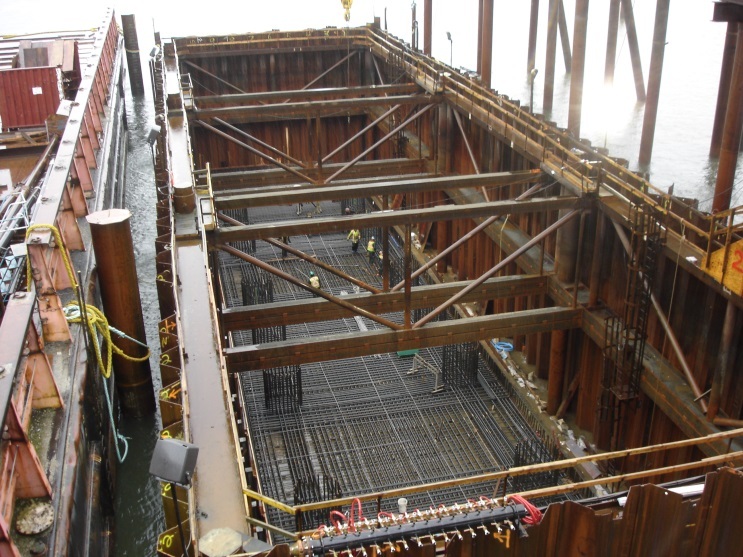 Designs included 50-foot by 170-foot by 50-foot deep cofferdams and access crane trestles with spans up to 100-feet. Also included were design of precast concrete picking devices, rebar picking and stability guying, access platforms for various stages of construction along with various support and pick items for demolition of the existing bridge. 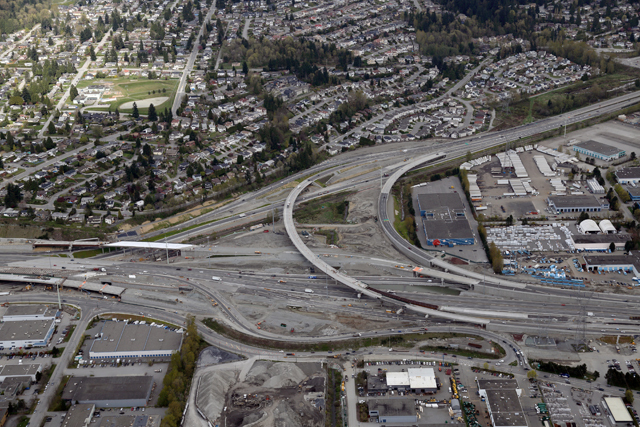 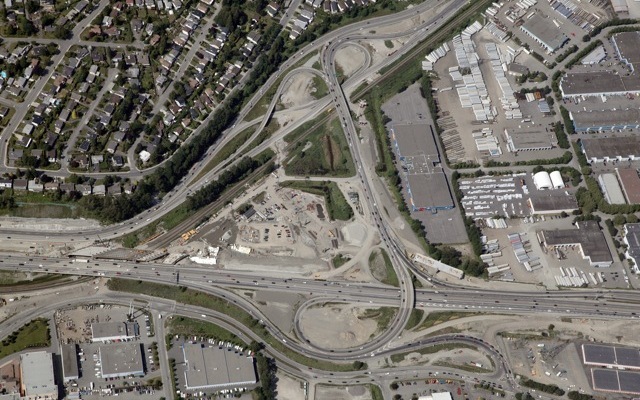 SMG provided construction engineering services for a major interchange redesign, the “Cape Horn Project”, located at the north end of the new Port Mann cable-stayed bridge in BC Canada. 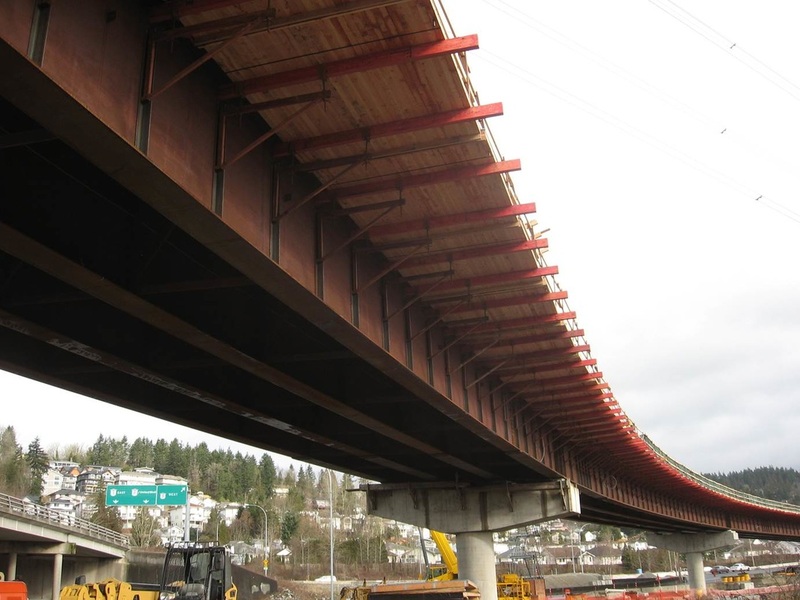 Design of overhang falsework, girder erection plans, temporary girder bracing, straddle bent and pier cap falsework, and miscellaneous shoring designs were some of the numerous design tasks completed by SMG for 10 different overpass bridges. 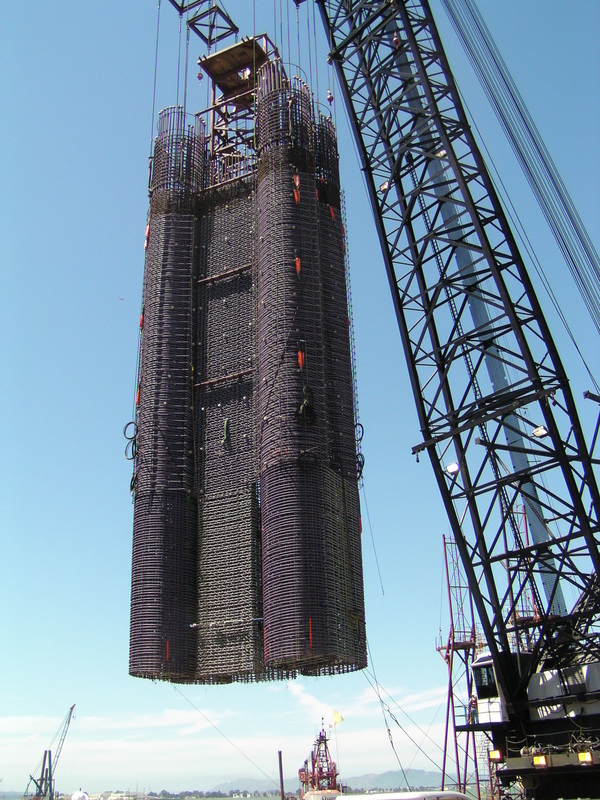 SMG provided construction engineering for a variety of tasks on this large, multi-year project. 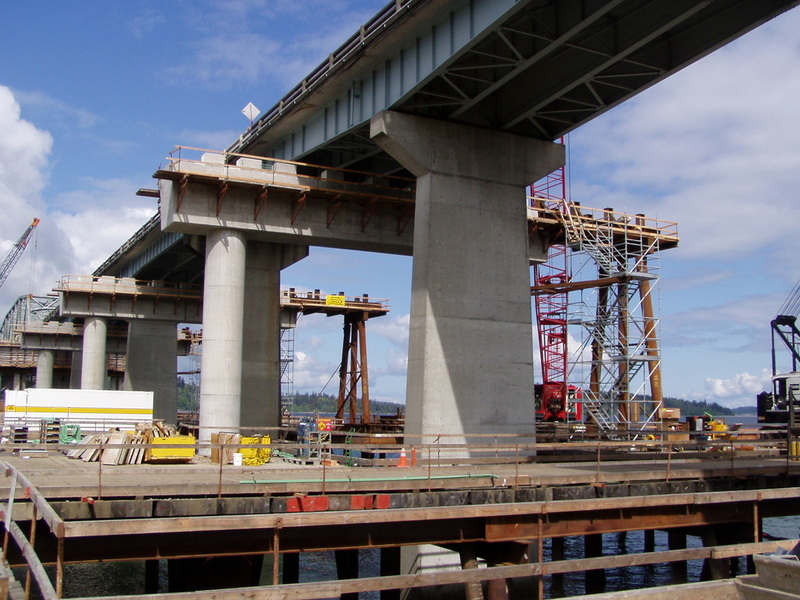 The project was predominantly precast, segmental box girder construction, with a few areas of cast-in-place, segmental box girders. 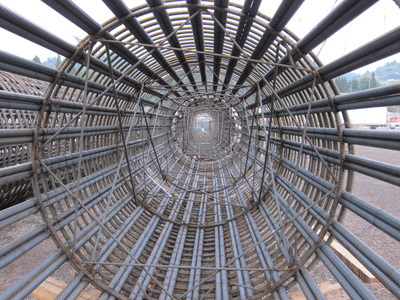 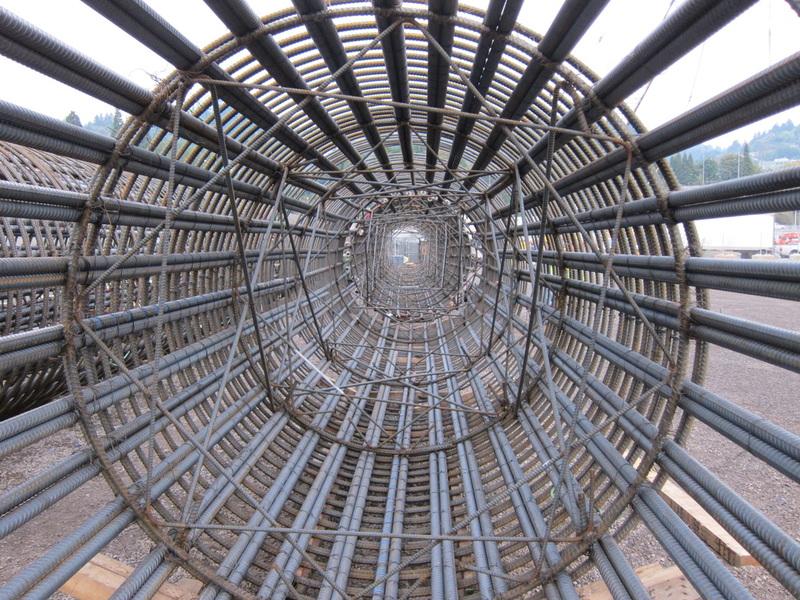 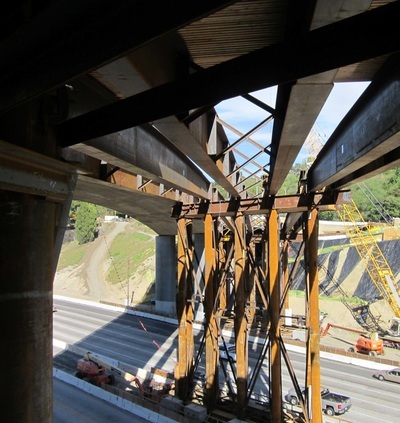 SMG designs covered a multitude of different areas: rebar cage and column form guying, lifting devices, shoring and retaining walls, crossbeam falsework, top deck falsework, fall protection, access platforms and straddle bent falsework. 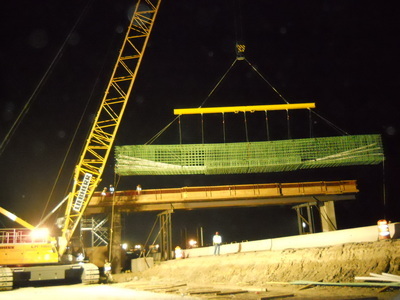 Traffic and scheduling was a large obstacle for this project. With the traffic congestion, it was difficult to shut down or reduce traffic lanes; therefore, it was essential that the falsework design did not encroach on the traveling public. Long or cantilevered falsework spans were incorporated in many designs to accommodate active traffic areas. 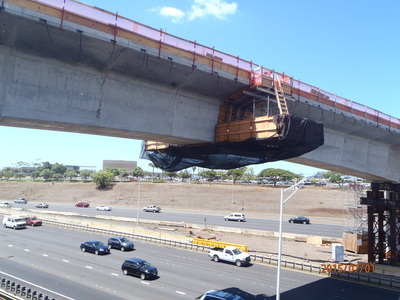 SMG was retained by a joint venture contractor for construction engineering design services for this large-scale bridge replacement project. 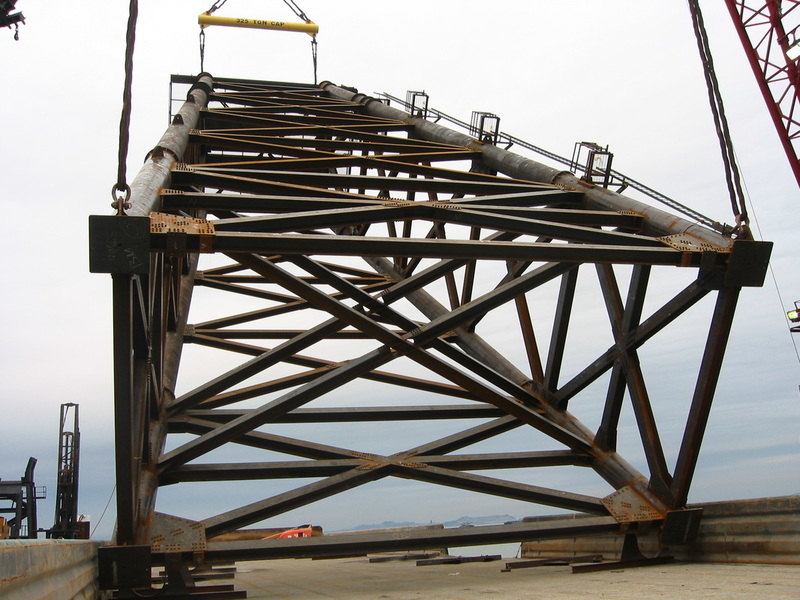 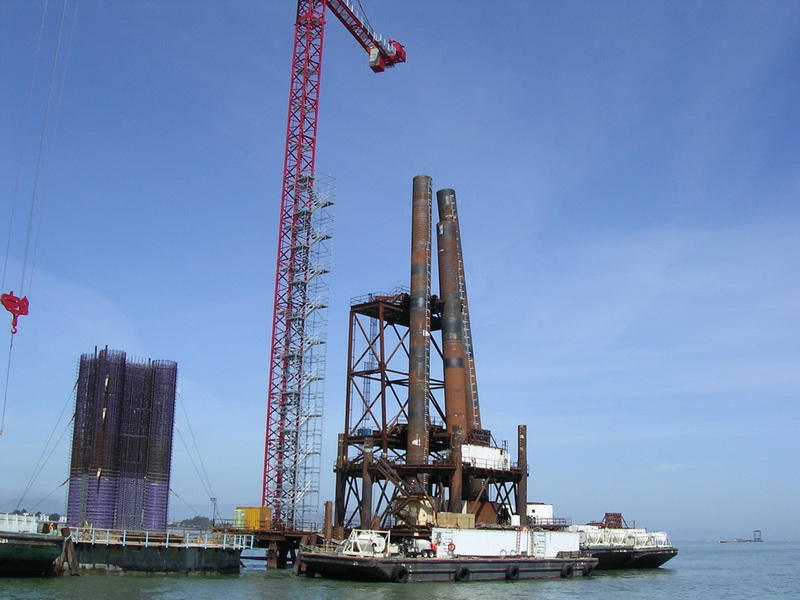 SMG's design services included pier cofferdam design, pier pile driving templates, work bridge design, pier table falsework design and heavy lift rigging design. 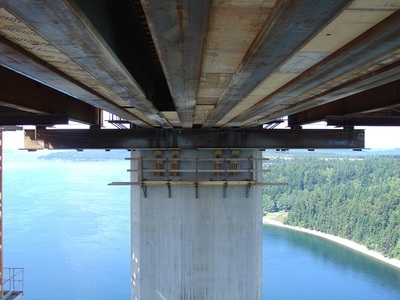 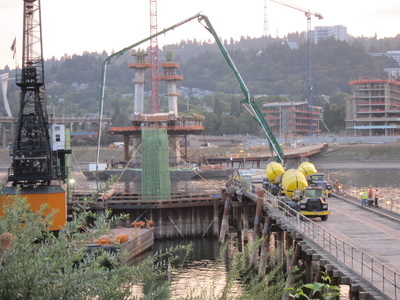 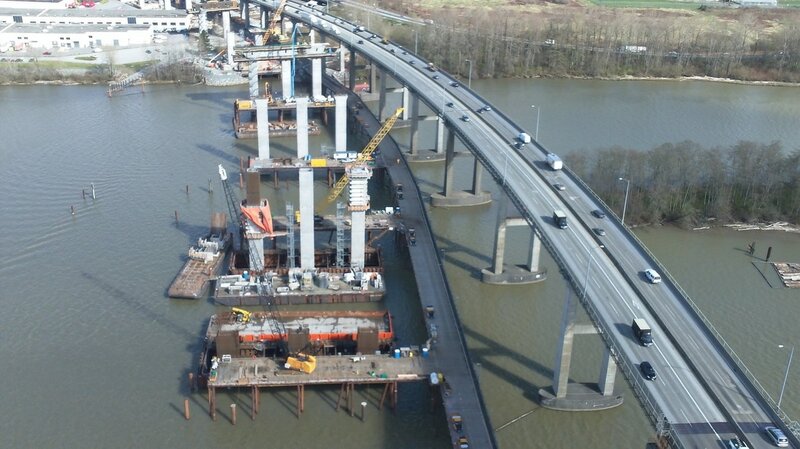 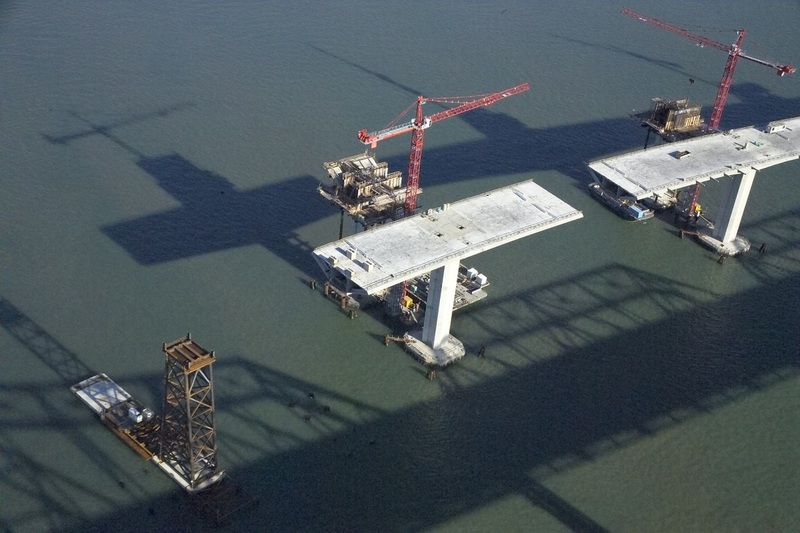 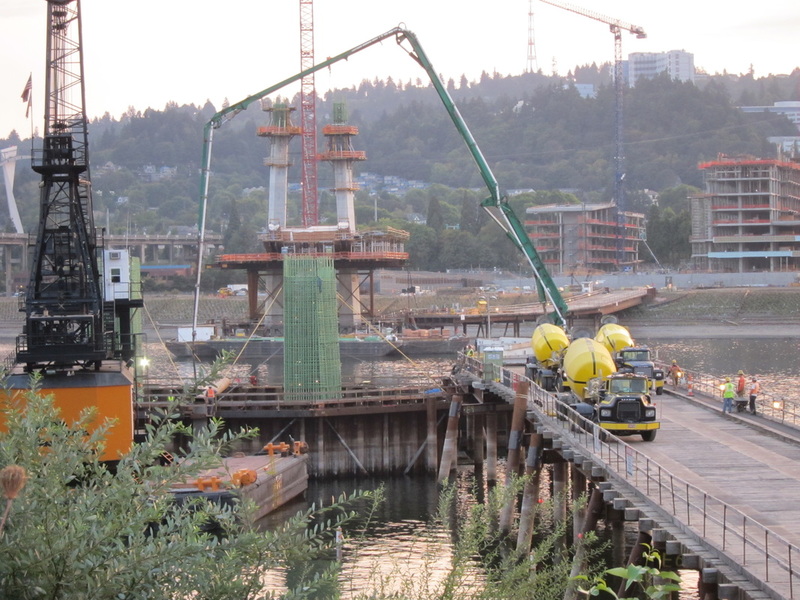 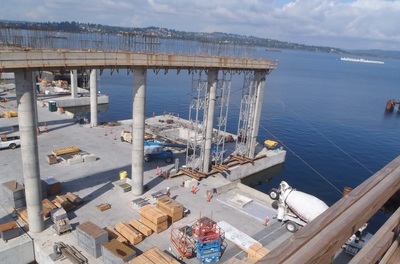 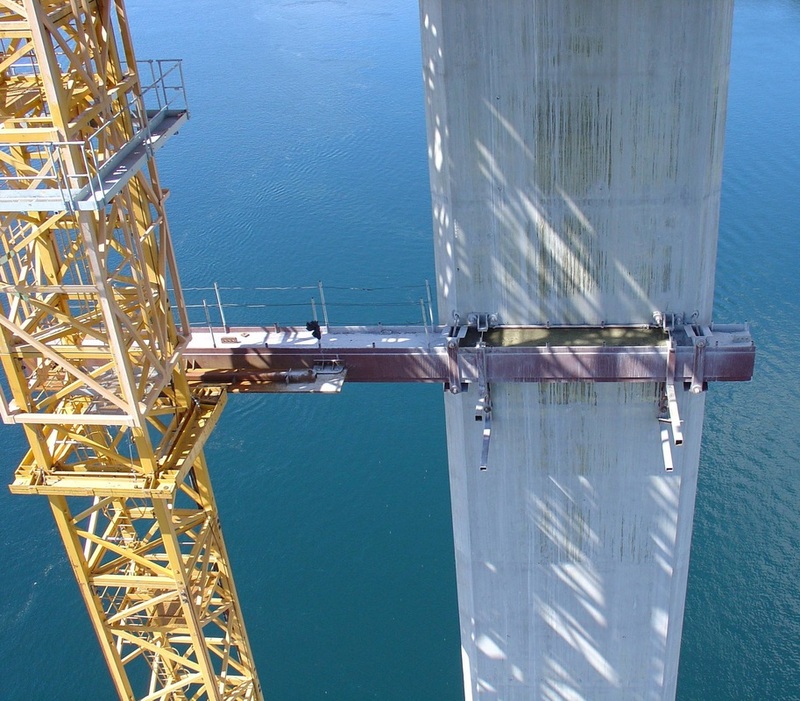 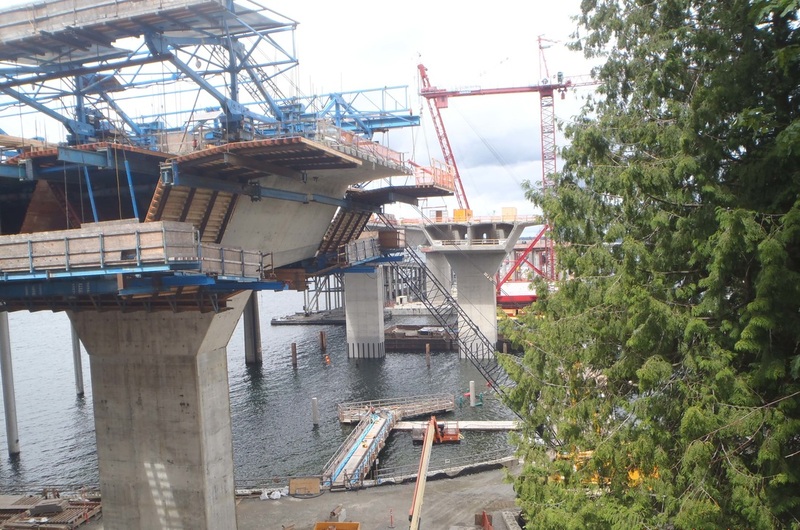 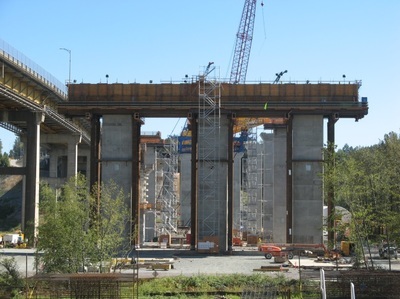 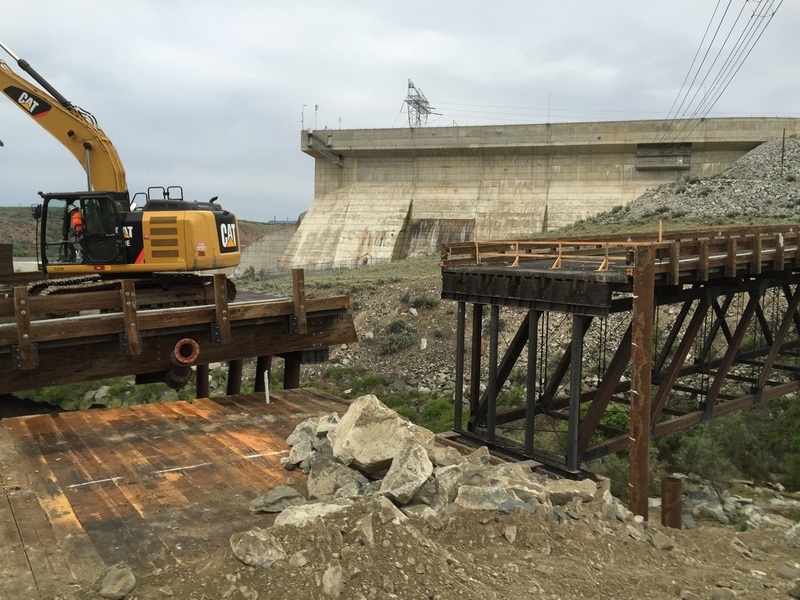 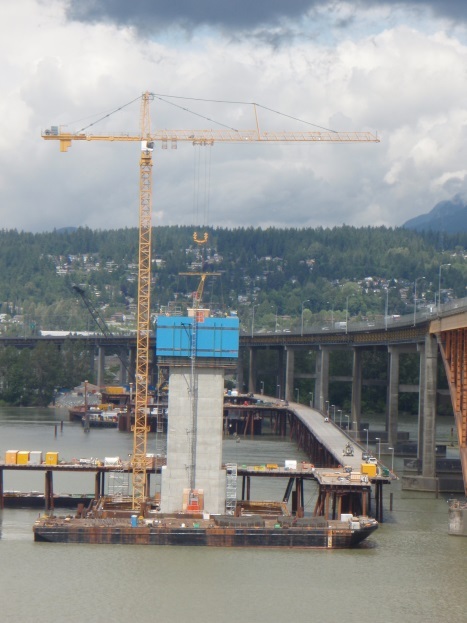 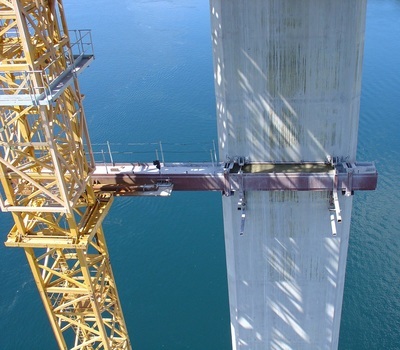 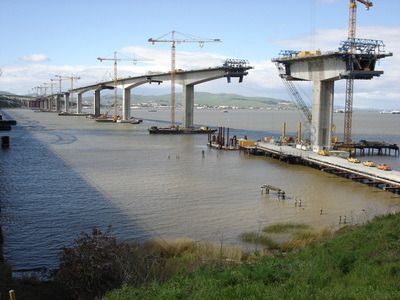 SMG provided construction engineering services for multiple tasks on this project such as: demolition plans for existing bridges, pier cap falsework, bridge deck overhang falsework, finish machine support, rebar cage and column form guying, horizontal lifelines, and access platforms. 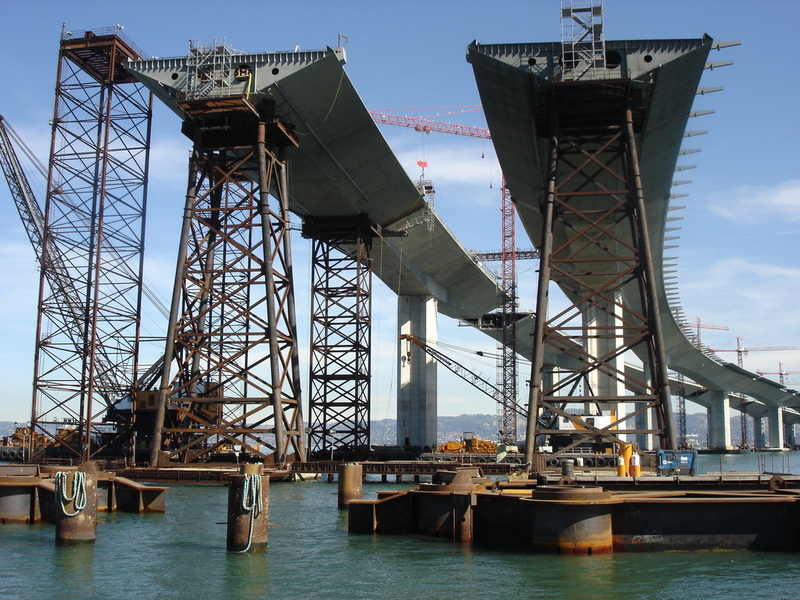 One of the more interesting and challenging tasks was the design of pier cap falsework that spanned across active highways. SMG provided construction engineering services for the design of overpass falsework for a cast-in-place, variable-depth box girder bridge. 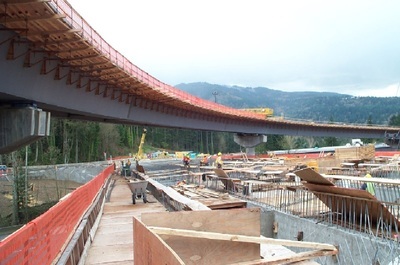 Challenges of these bridges included spanning over live traffic and designing falsework on a hard curve. 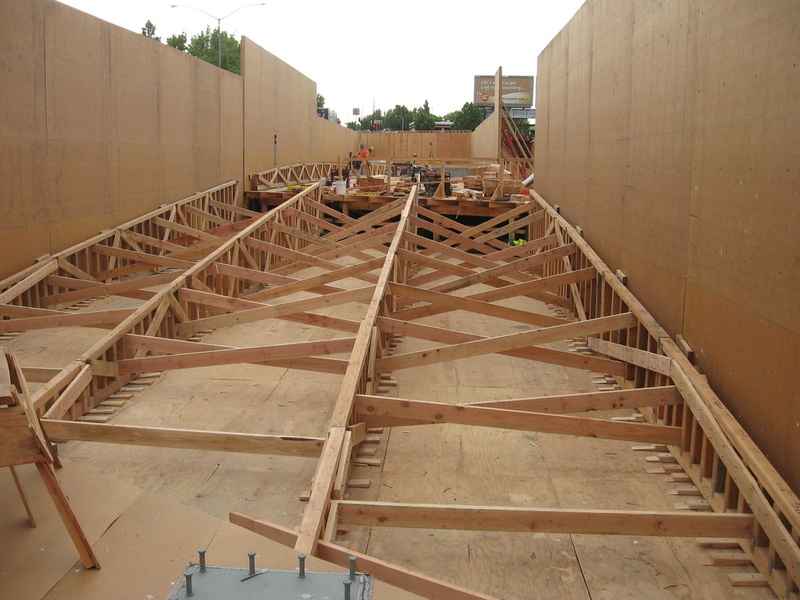 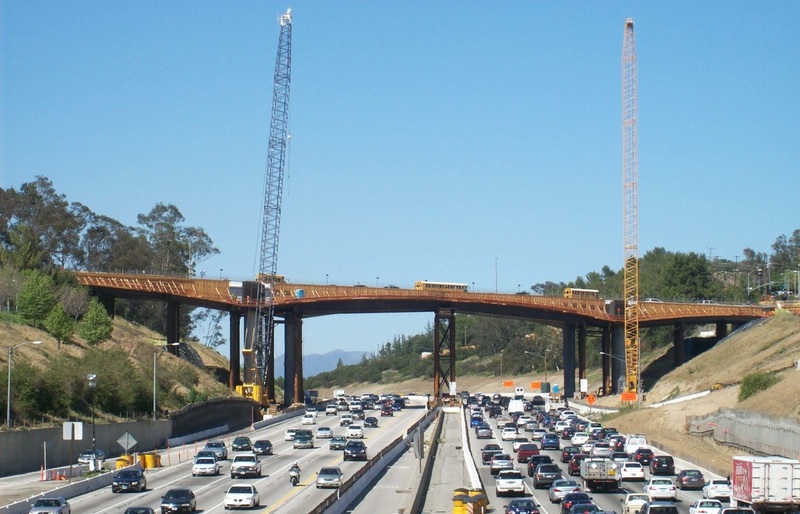 With traffic as a major consideration, SMG had limited space to place support bents for the falsework; so our design had to span longer distances with stringers. The longer the stringer, the more difficult it became to support the bridge while maintaining the curvature of the bridge. 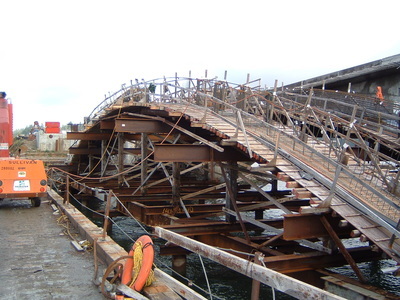 With the curvature of the bridge, superelevation increases, which caused a challenge for placing the falsework deck at a steep slope. 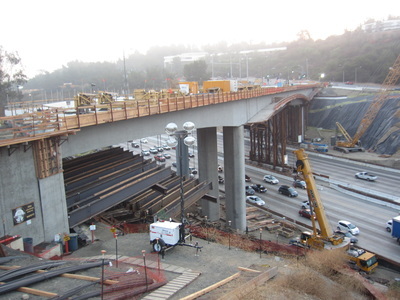 During the closure of the busiest freeway in the US for demolition of the old Mulholland Drive Bridge, local residents termed the construction “Carmageddon.” The bridge was constructed in 2 stages, and the eastbound phase 1 falsework was recycled for the phase 2 westbound construction. 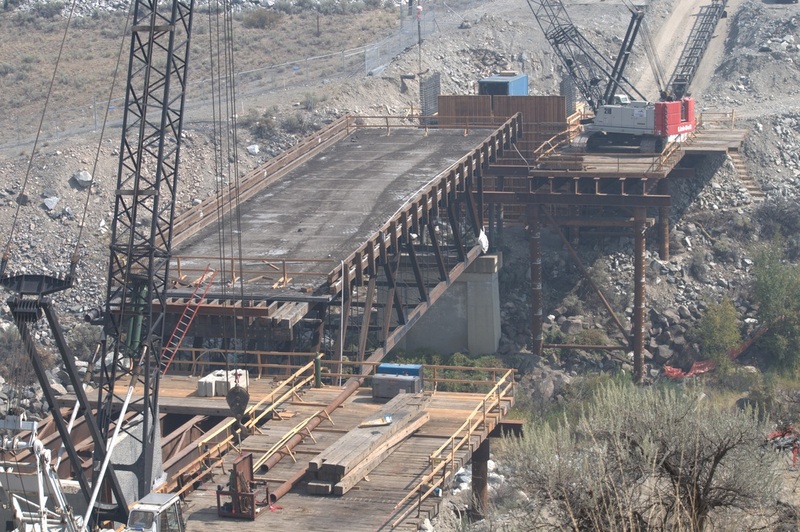 SMG provided construction engineering design services for this bridge project. 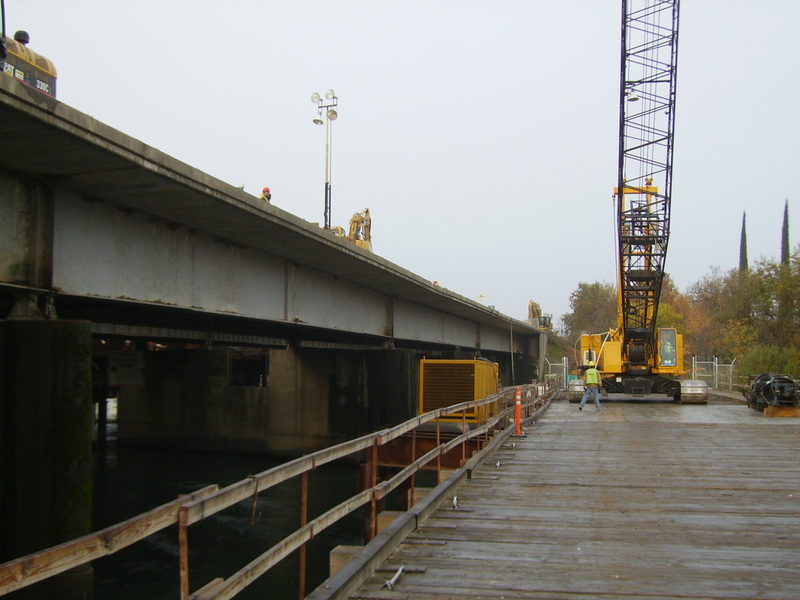 SMG's design services included a 4100W work bridge, a 4100W ringer work platform, a barge access ramp, in-water pier cofferdam shoring, cast-in-place box girder bridge falsework both over land and water, and pier table falsework. 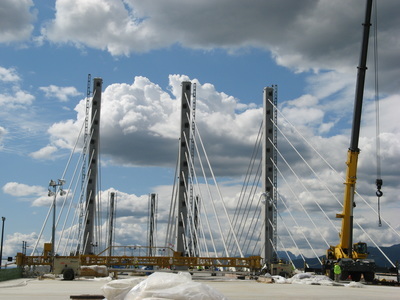 The bridge opened in 2007. SMG provided construction engineering services for the Maple Street Bridge. Designs included the arch and superstructure falsework. SMG provided a variety of construction engineering services for this six-lane cable-stayed bridge. 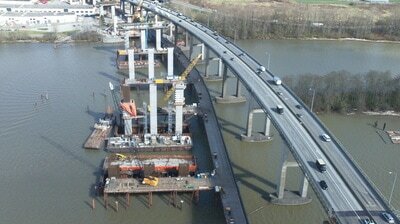 The new bridge is approximately 4.5 miles in length. SMG's involvement included designing crane trestles for ice influences, tower crane foundations, cofferdams, falsework and structural review. 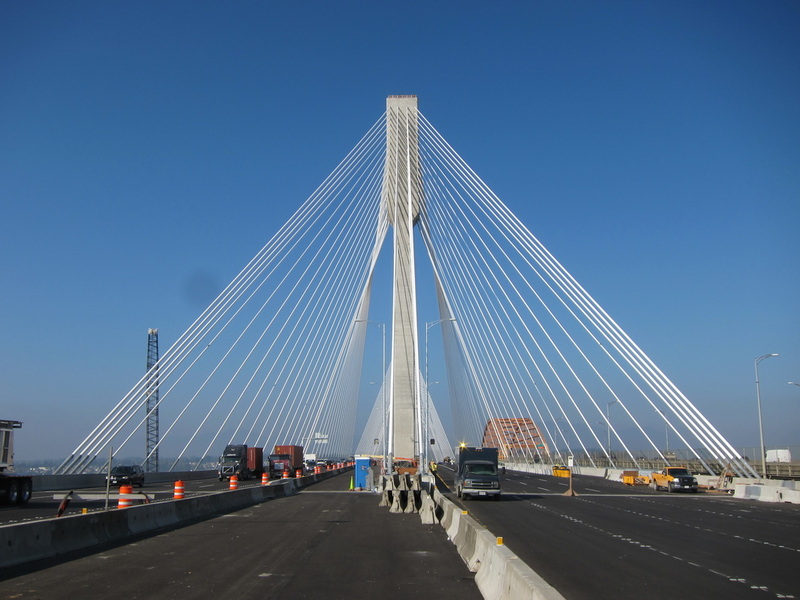 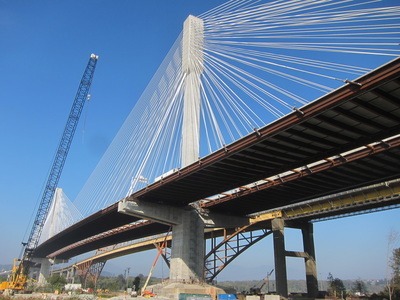 SMG was retained to provide numerous construction services for this seven-lane cable-stayed bridge. 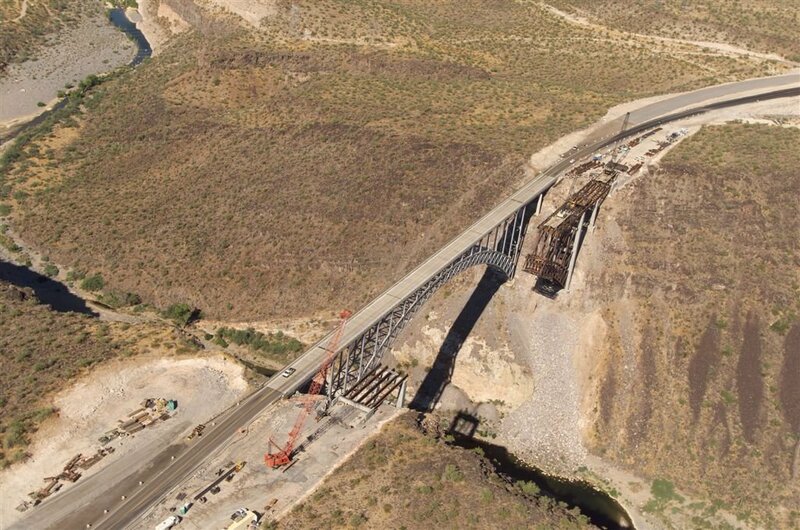 The bridge was built between two existing bridges, at a much higher elevation to allow for boat traffic to pass. 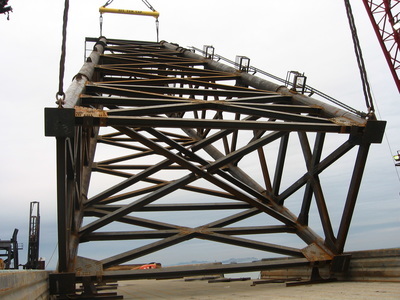 SMG tasks included rebar cage handling, crane trestles, pile lifting frames, falsework and bracing. 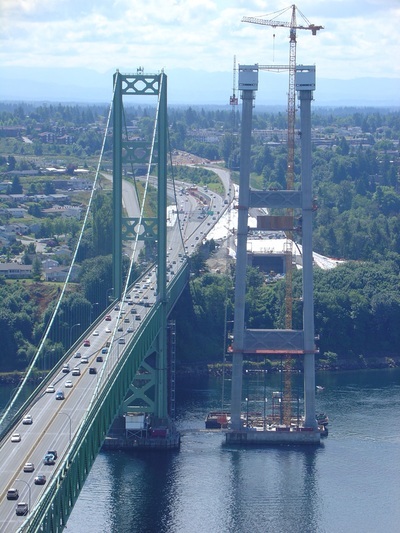 SMG was retained by the contractor for work on the new Tacoma Narrows Bridge, a suspension bridge that replaces the original bridge built in 1950. 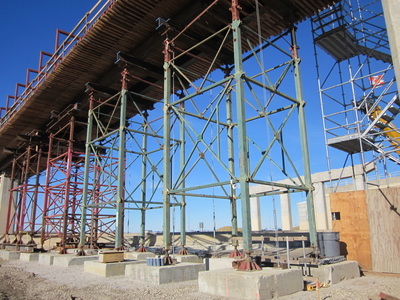 SMG designed falsework for support of the lower, mid-, and upper tower cross struts. 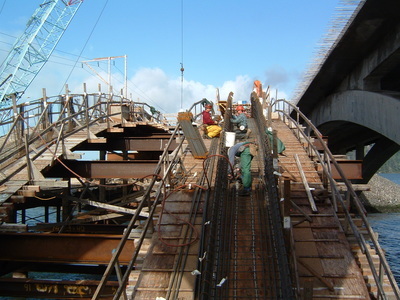 Work on the bridge was completed in 2008. SMG provided engineering services for several aspects of this unique bridge expansion and upgrade. 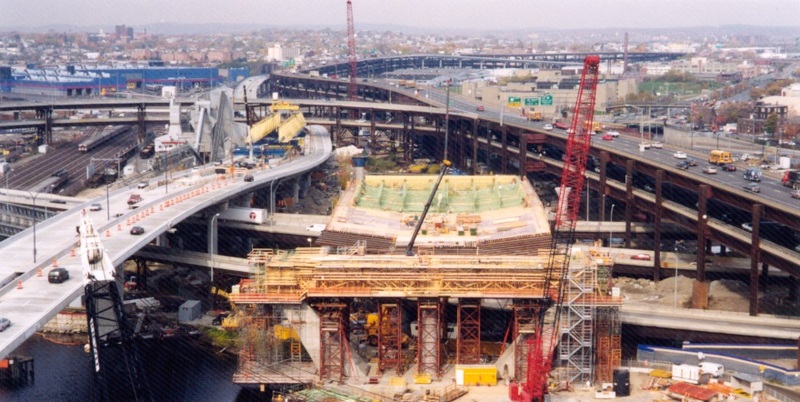 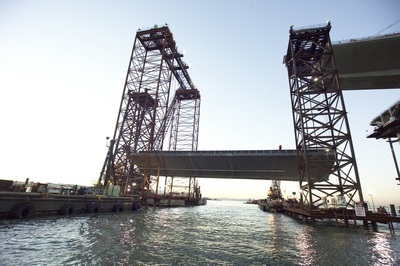 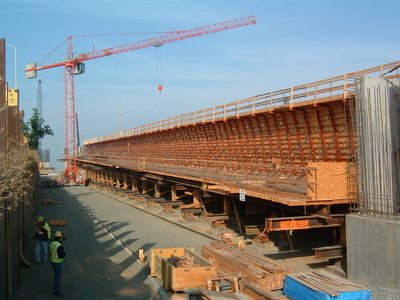 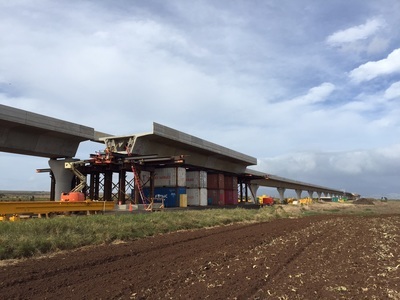 The new approach spans were constructed on falsework alongside the existing spans. 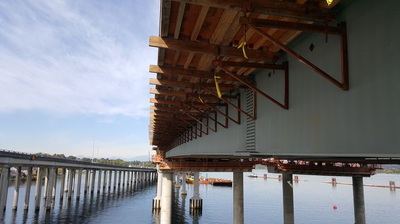 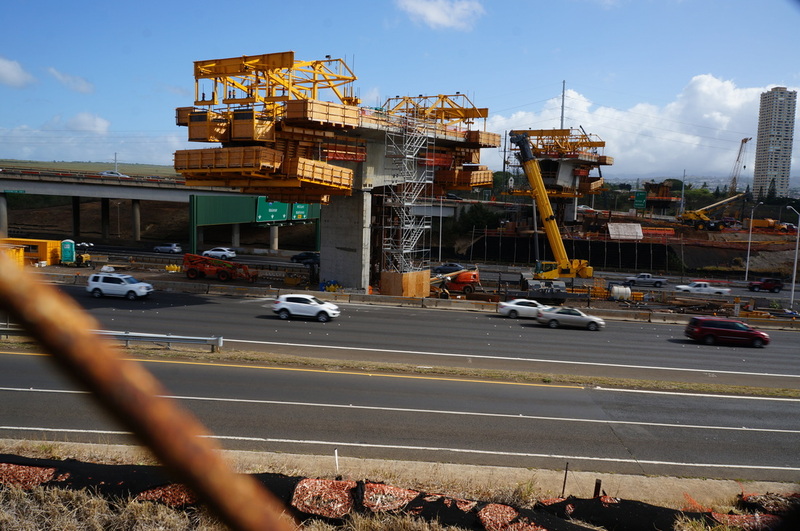 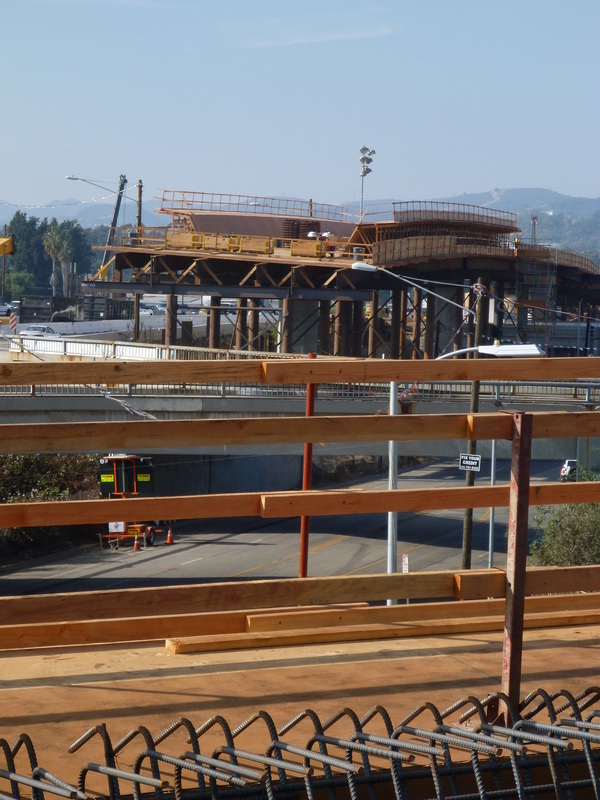 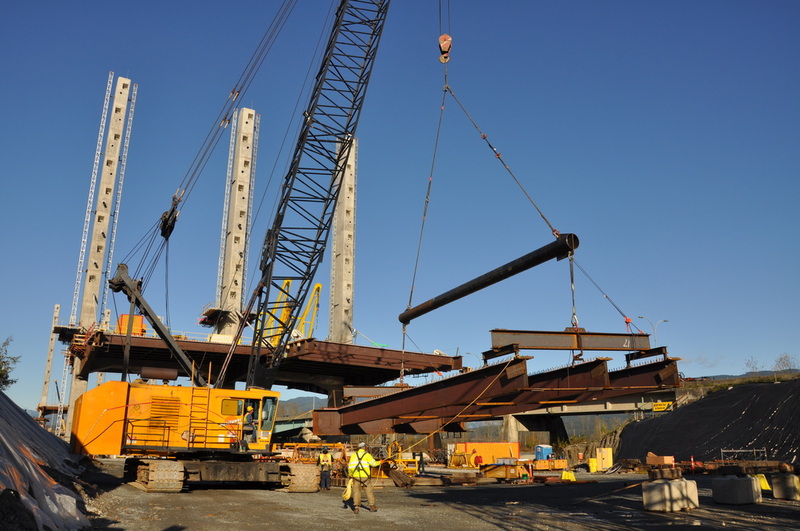 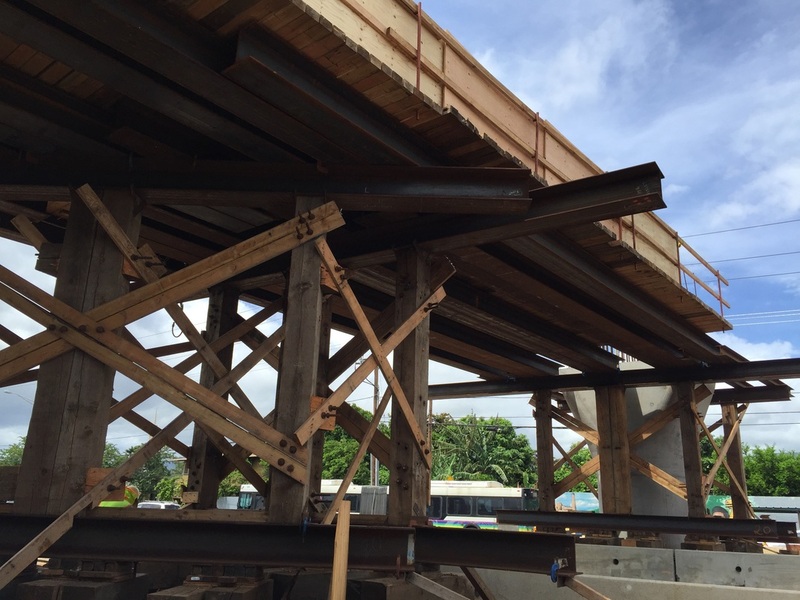 Over a three-day traffic closure, the old spans were rolled onto adjacent falsework and the new spans were rolled into place. SMG designed the falsework for the new and old spans, along with a girder erection plan and an extensive crane trestle. 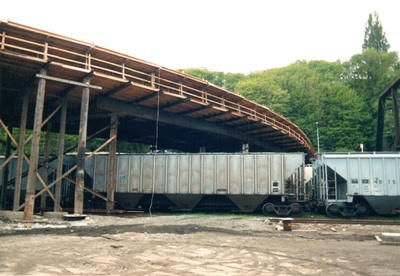 SMG also developed the tracks for the existing and new span-rolling system. 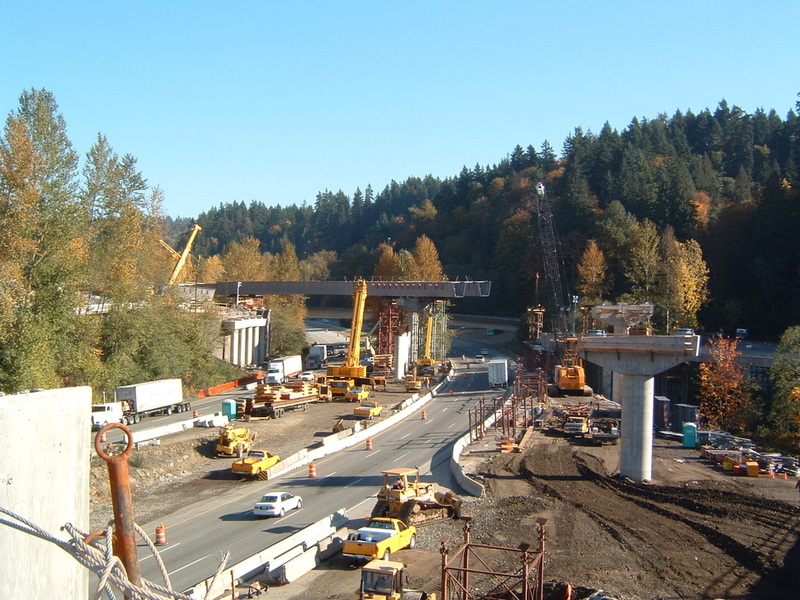 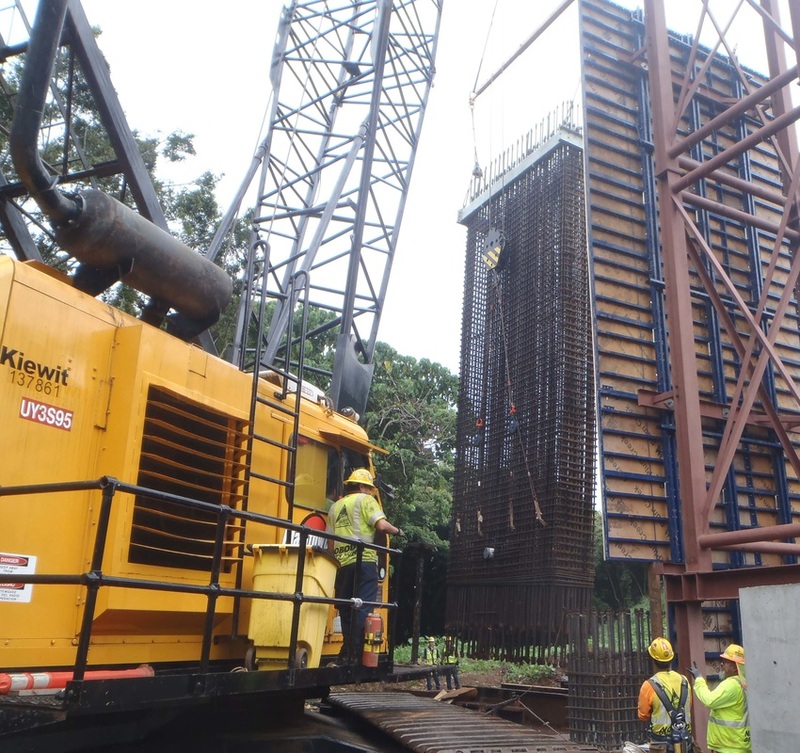 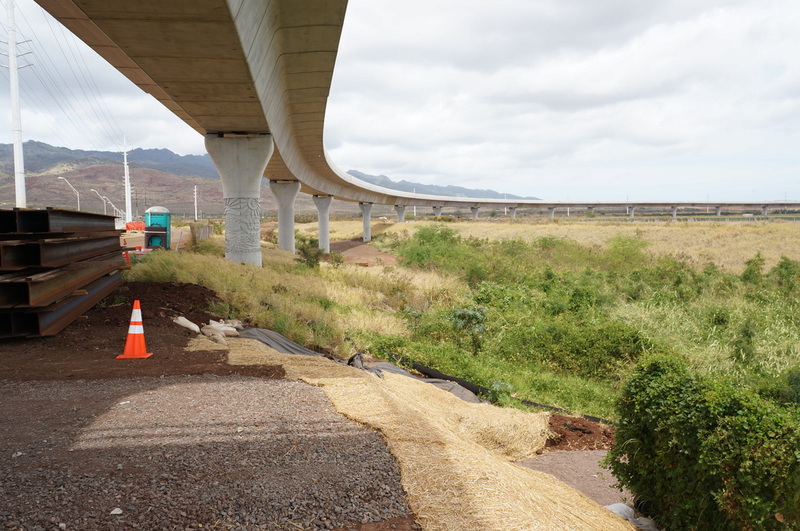 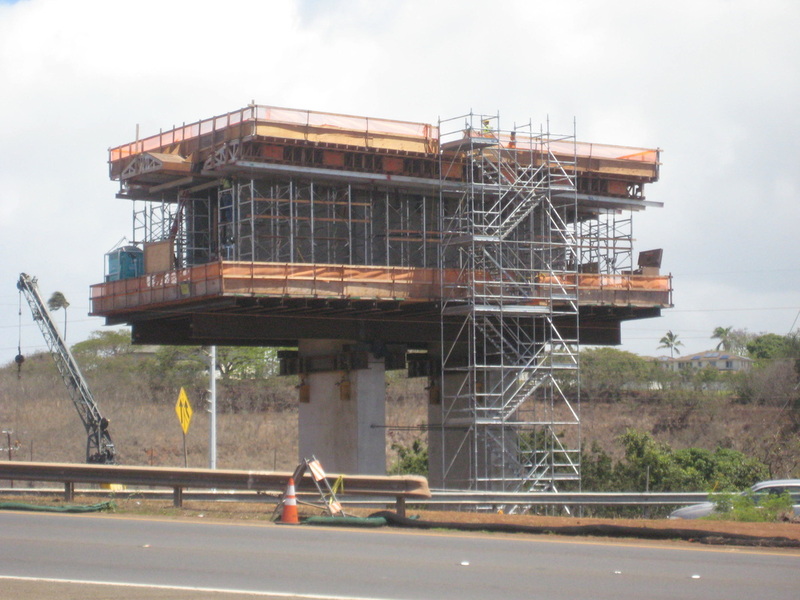 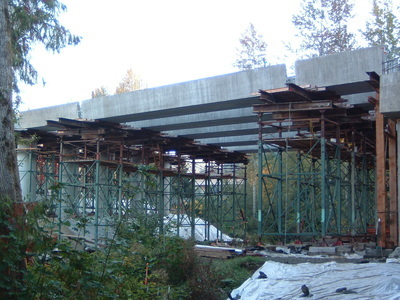 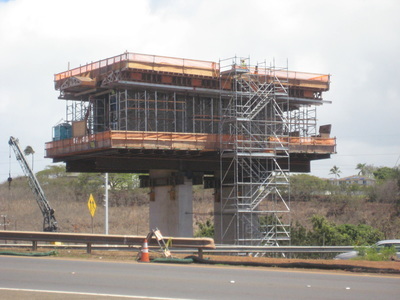 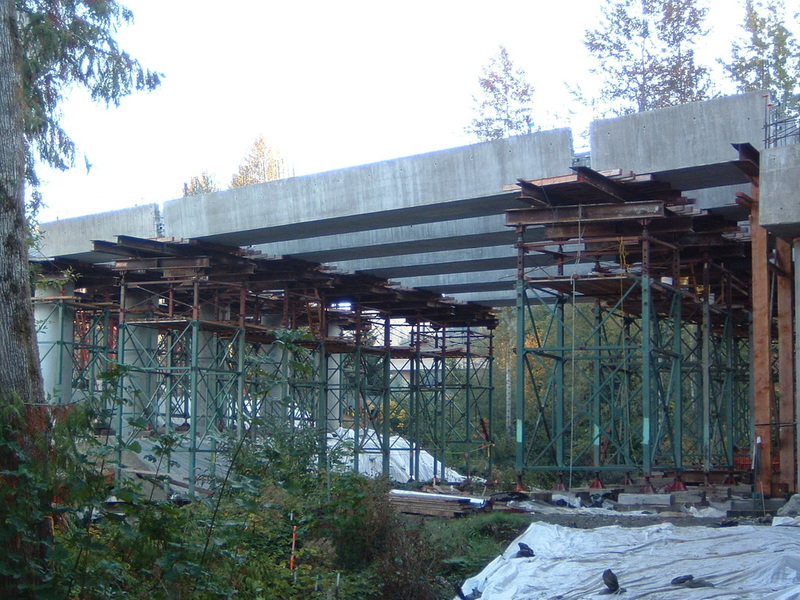 SMG was retained to provide construction engineering services for this bridge replacement project. The new six-lane bridge replaced two structures built in 1948 and 1968. 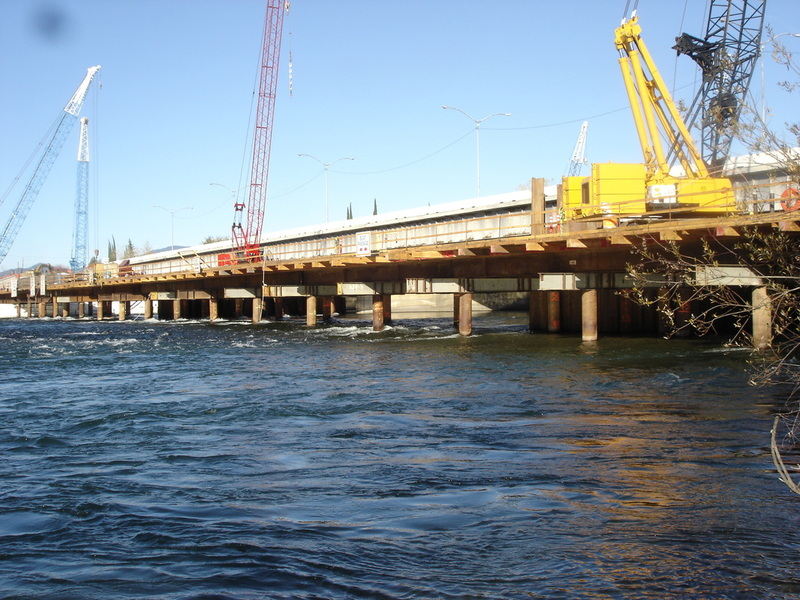 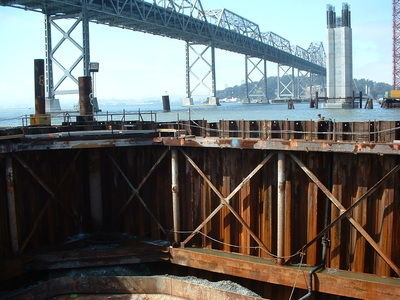 Designs included pier cofferdams, falsework, access trestles, shoring, an oscillator reaction frame and bridge demolition engineering. 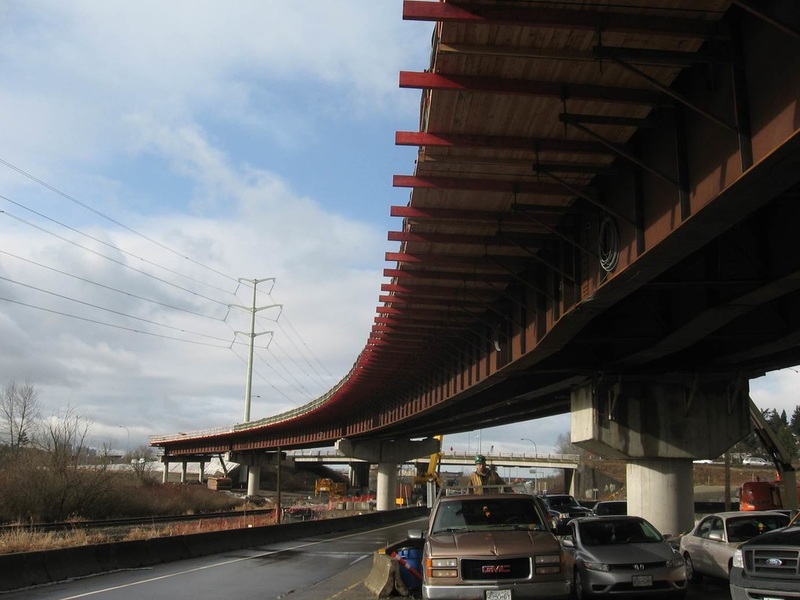 SMG provided construction services for this interchange project. 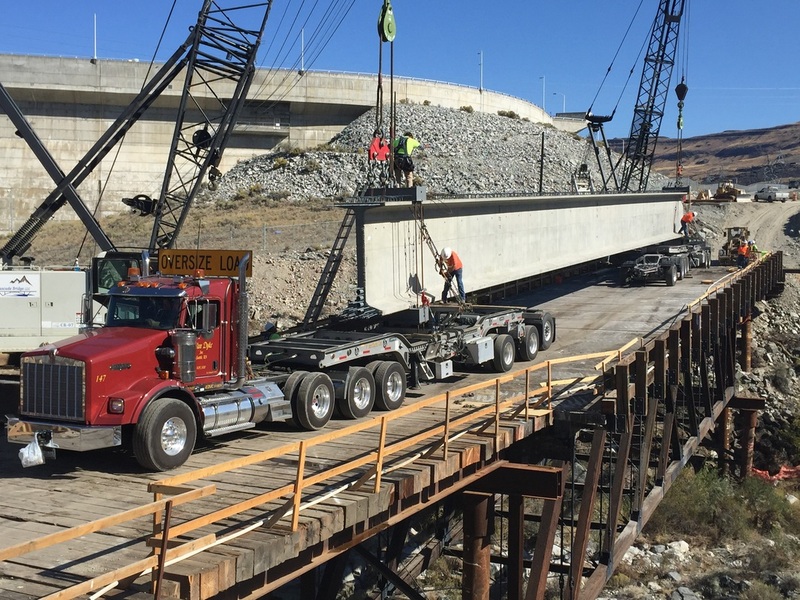 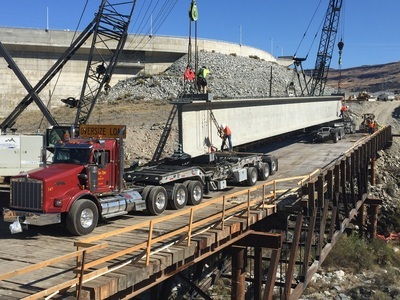 SMG's design services included falsework design for a cast-in-place concrete box girder bridge, erection engineering and falsework design for both steel and concrete tub bridges. 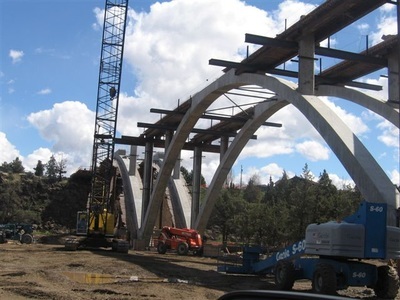 SMG designed falsework, shoring, work trestles, and haul bridges for three bridges over rugged terrain in the Lake Shasta area of northern California. 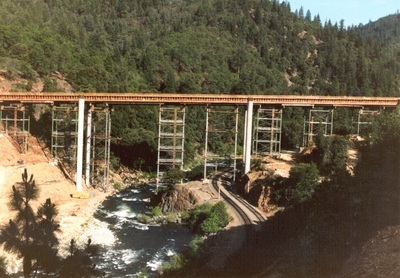 The falsework design required tower heights of up to 120 feet, spanning roads, railroad tracks, canyons, and the Sacramento River. 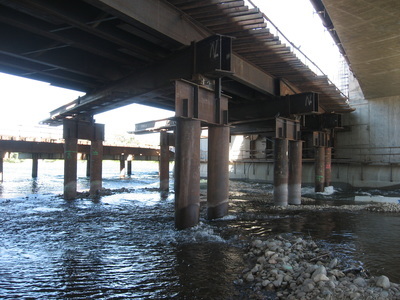 Tower legs near the river were designed for water flow during springtime flooding. SMG was involved in several construction phases of a new aerial tram in Portland, Oregon. 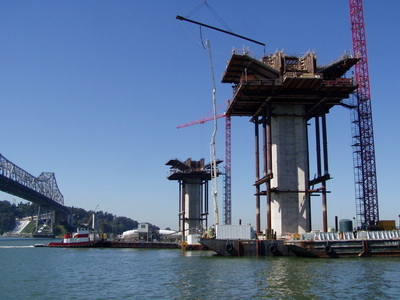 The tram cars travel 3,300 linear feet, rising 500 vertical feet between the south waterfront terminal and upper terminal at OHSU's main medical campus. SMG developed the temporary shoring for the excavation of the base structure. 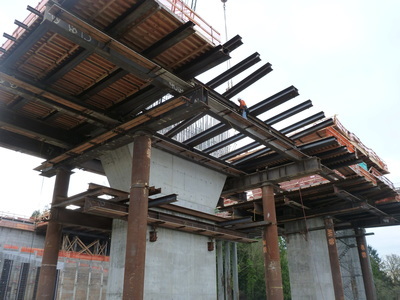 SMG was also responsible for the falsework for the elevated floor of the base structure and the top structure. 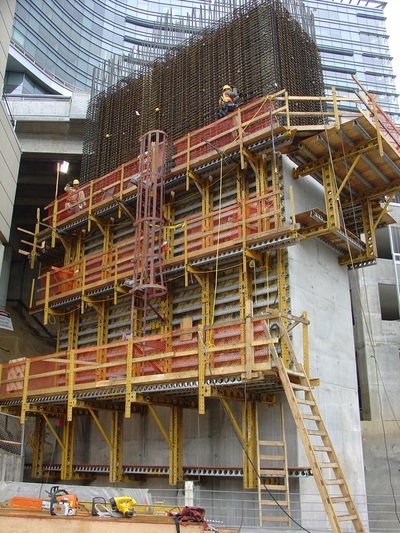 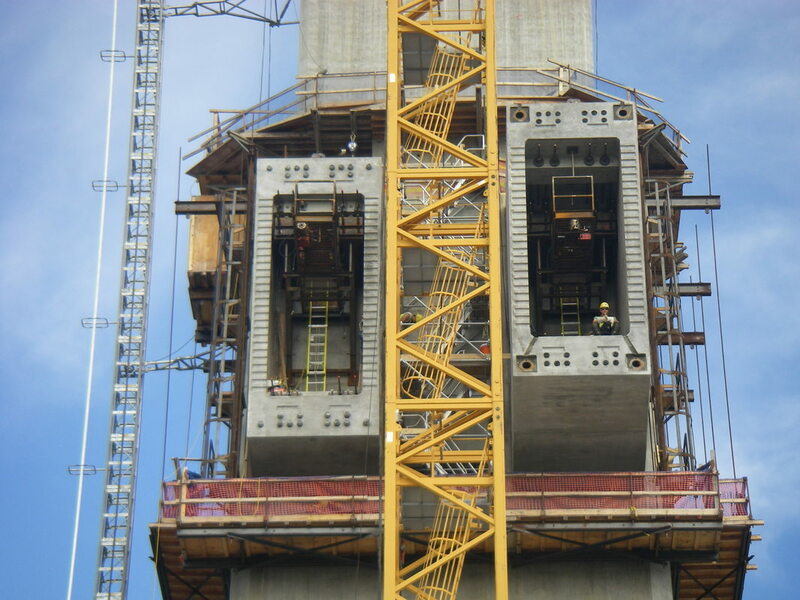 The project had several highly specialized formwork requirements, including a form panel access system. SMG planned the stabilization of an existing adjacent structure with reshoring for its rooftop crane pick access. 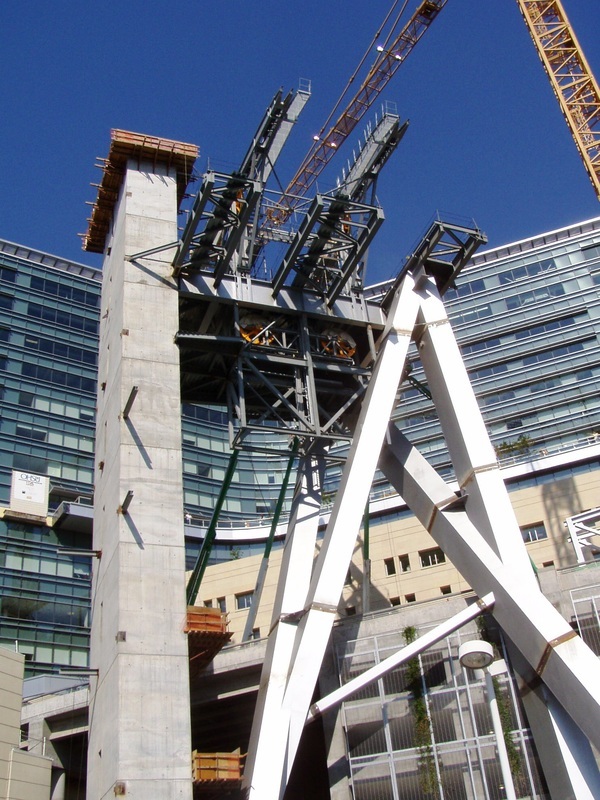 For the tram construction, SMG also developed the calculations for the tower erection and the top structure diagonal strut erection. SMG designed falsework for the Fourth Street bridge in Tacoma, Washington. This bridge crosses the Burlington Northern Railroad on a curved skew angle, requiring long falsework spans. 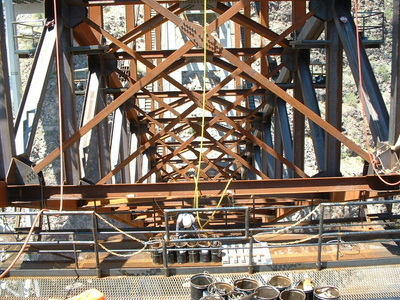 To add to the complexity of the project, the required railcar clearance left only inches below the bridge for the falsework. 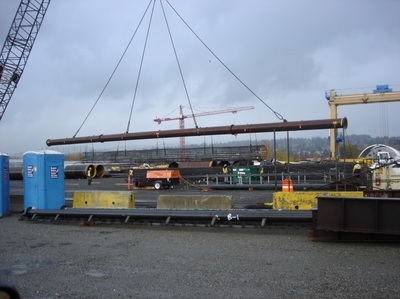 SMG provided the structural design, submittals to the City of Tacoma, and the Burlington Northern Railroad site inspectors. 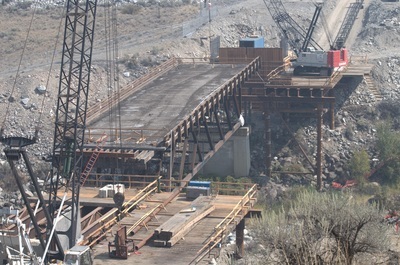 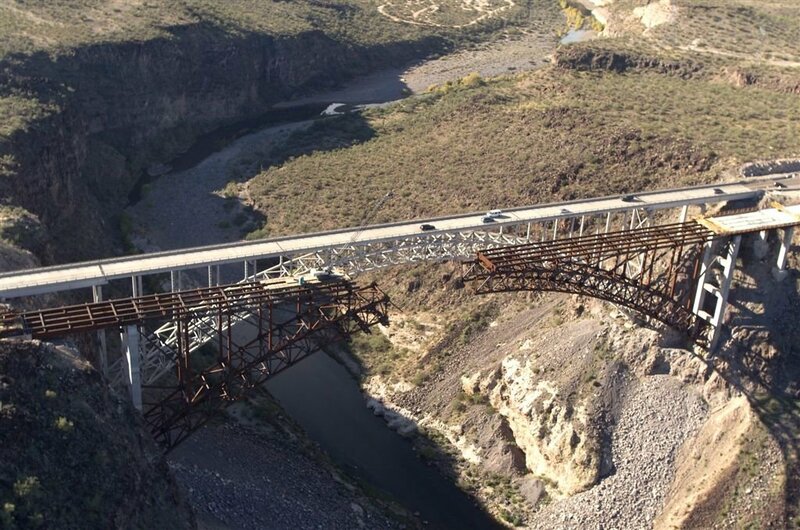 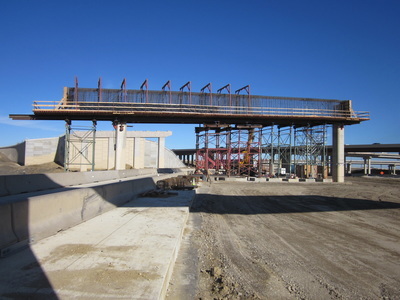 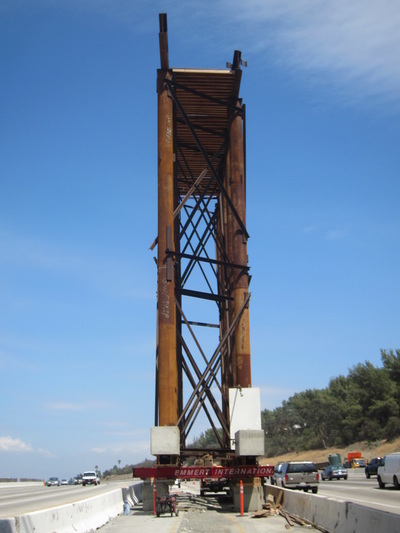 SMG provided erection engineering for the Burro Creek Bridge steel arch construction. 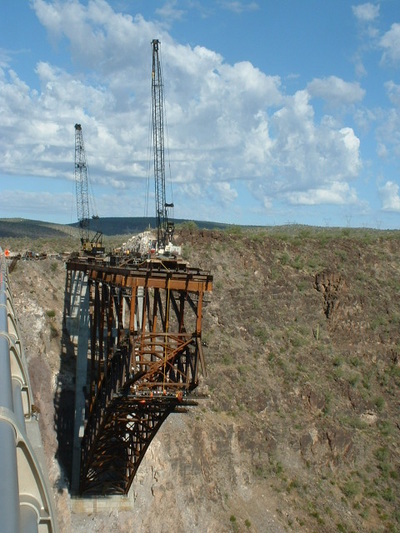 SMG designed a tieback system, temporary bracing for the arch truss during erection, and anchorage for the tieback to allow a cantilevered erection sequence. 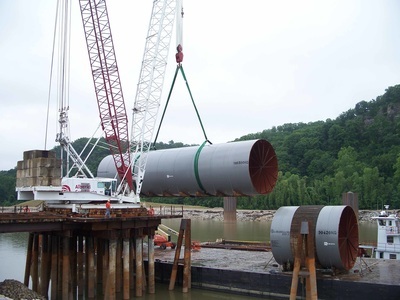 Hydraulic rams were incorporated in the tieback system to provide adjustment to the cantilever as required during stages of erection. 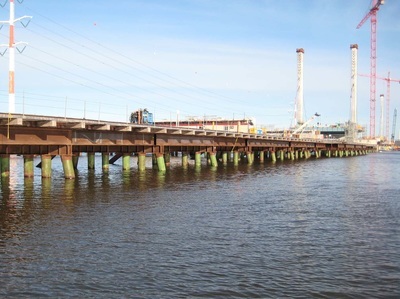 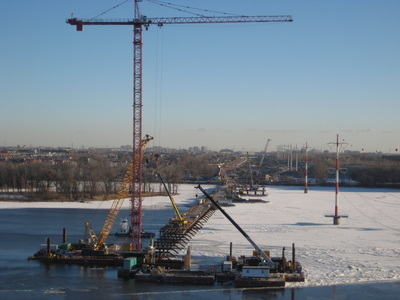 SMG provided structural design for the north backspan falsework of the Charles River bridge in Boston, Massachusetts. 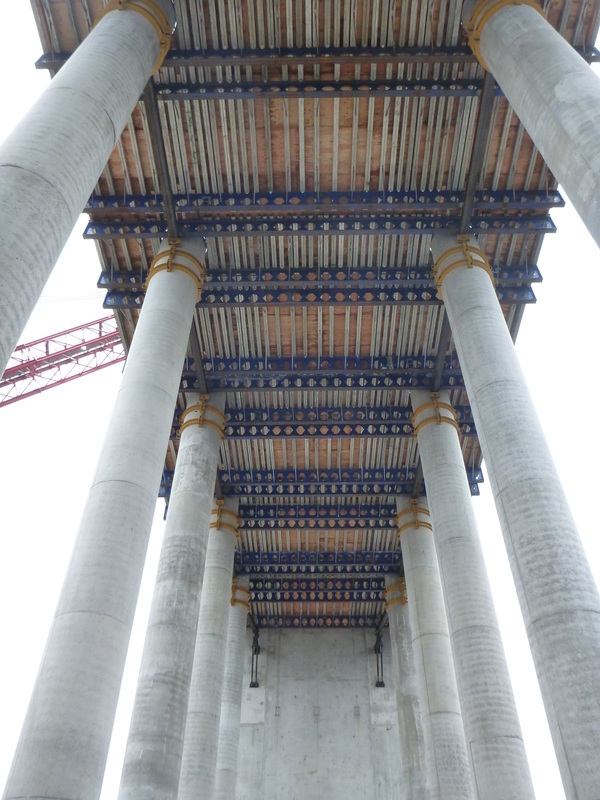 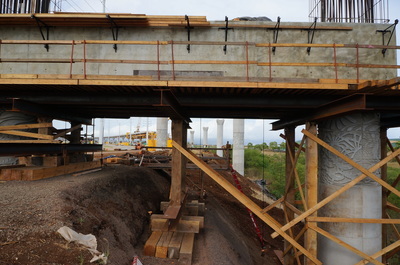 The high-level falsework consisted of pipe columns and concrete footings. 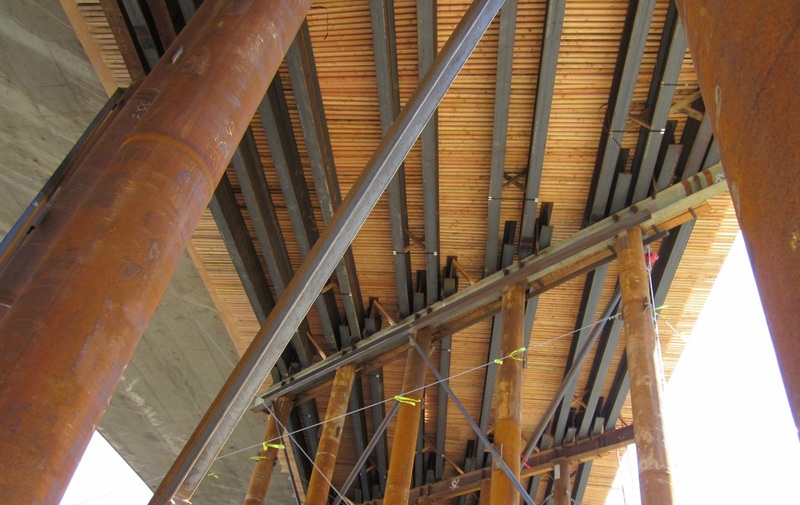 The numerous traffic corridors which sliced through the falsework created design challenges. SMG designed a total bridge enclosure and work deck structure for this challenging environment. Originall designed by Conde B. McCullough and built on the Oregon coast in 1926, the Rocky Creek (Ben Jones) Bridge required a major structural rehabilitation. 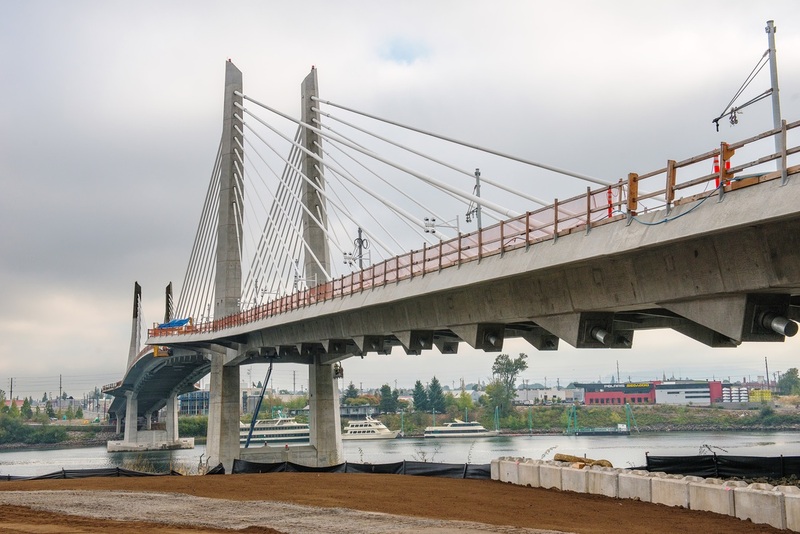 The contractor was selected by Oregon DOT to reestablish the structural integrity of the bridge while also maintaining the bridge's historic character. 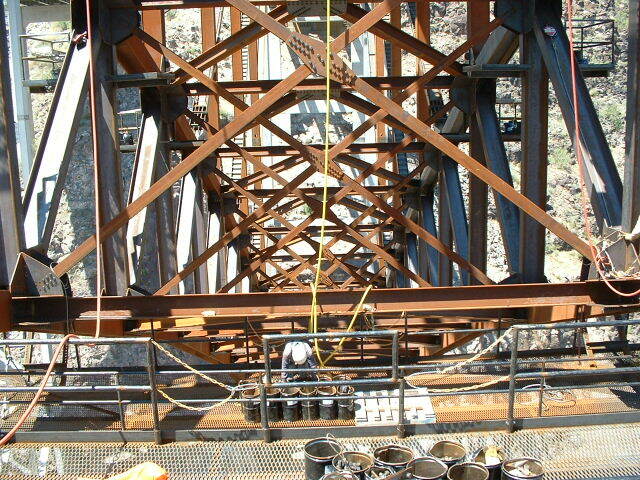 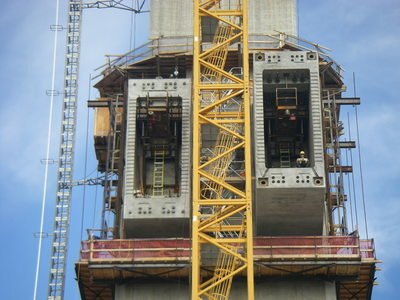 The enclosure panels were cycled to the lower half of the bridge for the second phase of construction. 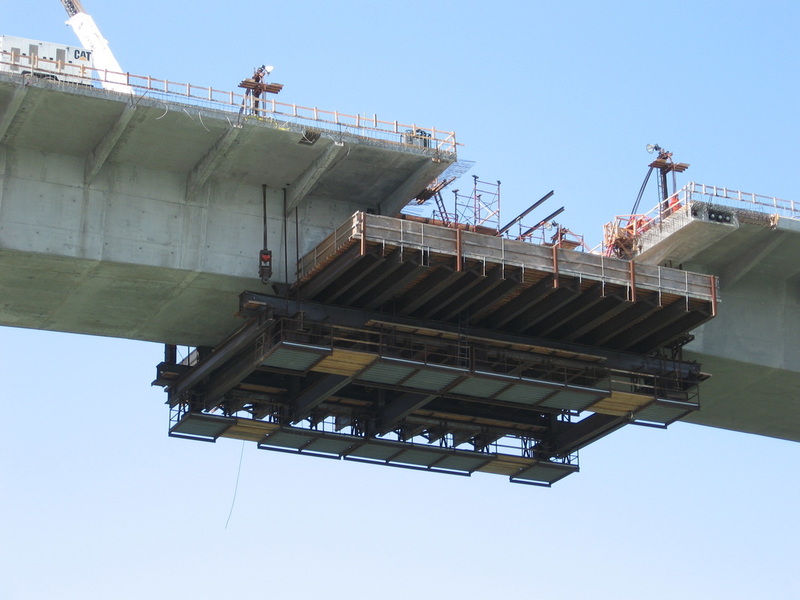 SMG designed a platform and trestle for a 4100W Ringer crane. 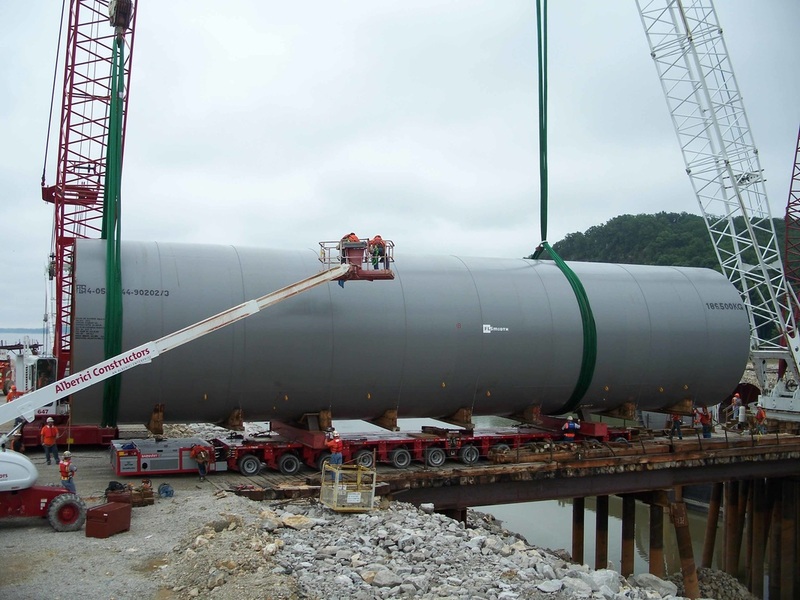 The crane received the kiln pieces which were shipped by barge for the Holcim Cement Plant. 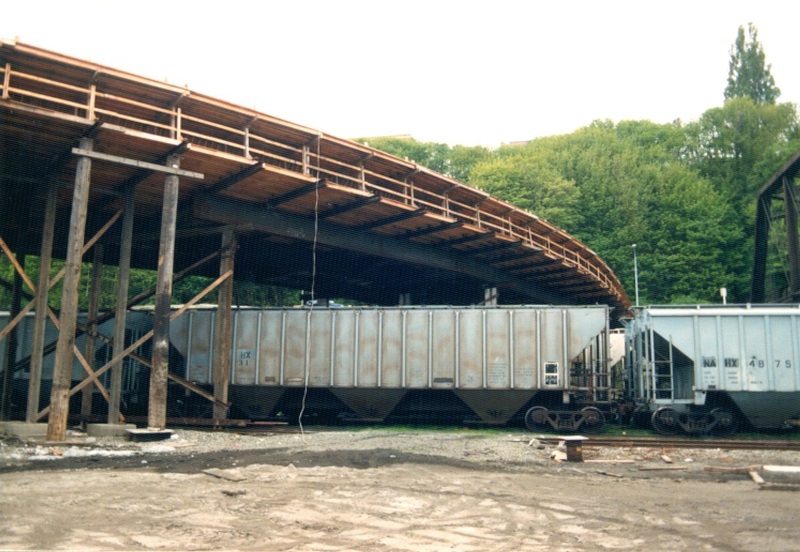 The trestle was designed to support the crane for offloading pieces from the barge and to trailers which carried the components to the cement plant. 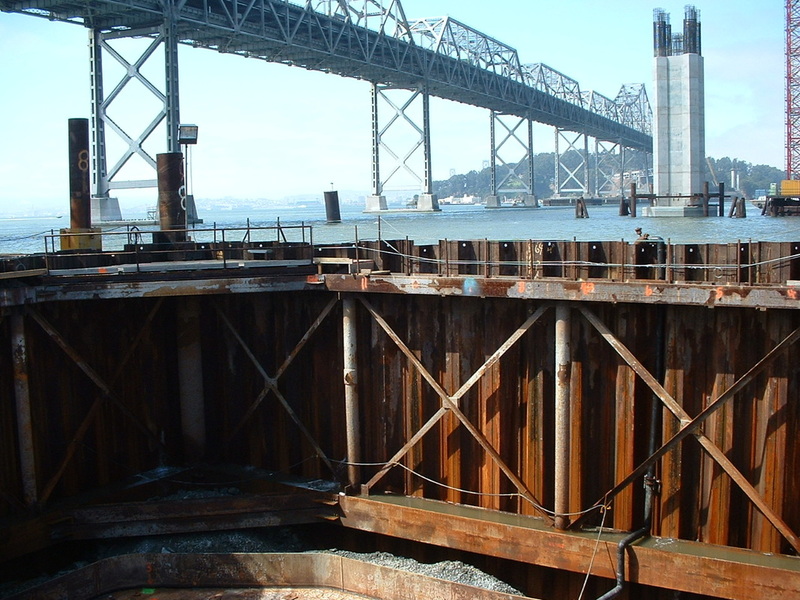 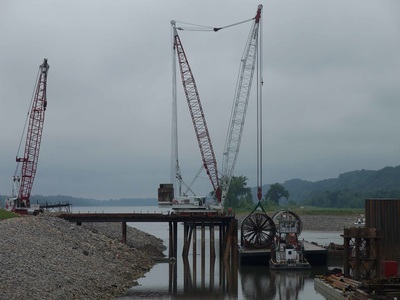 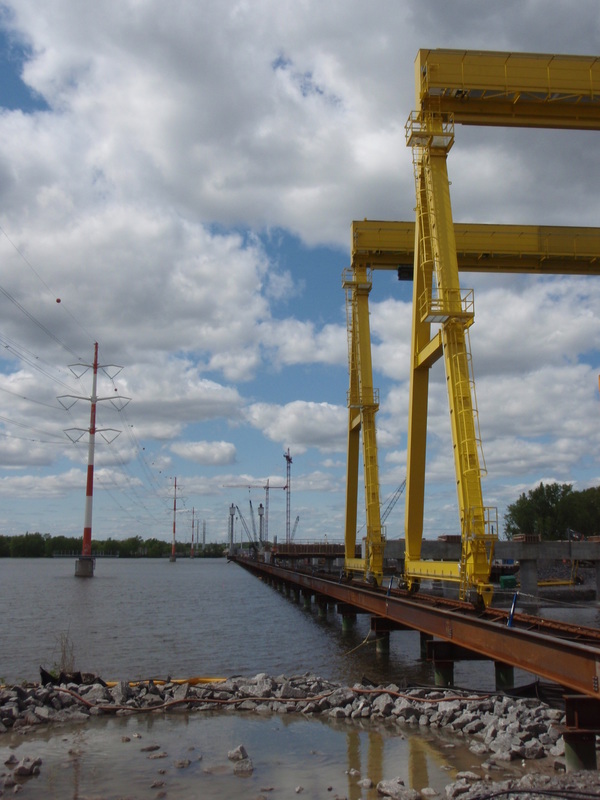 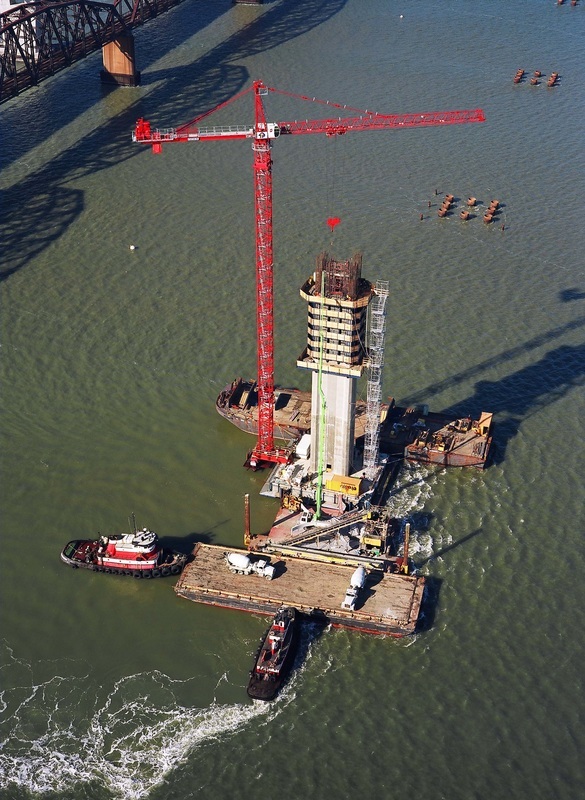 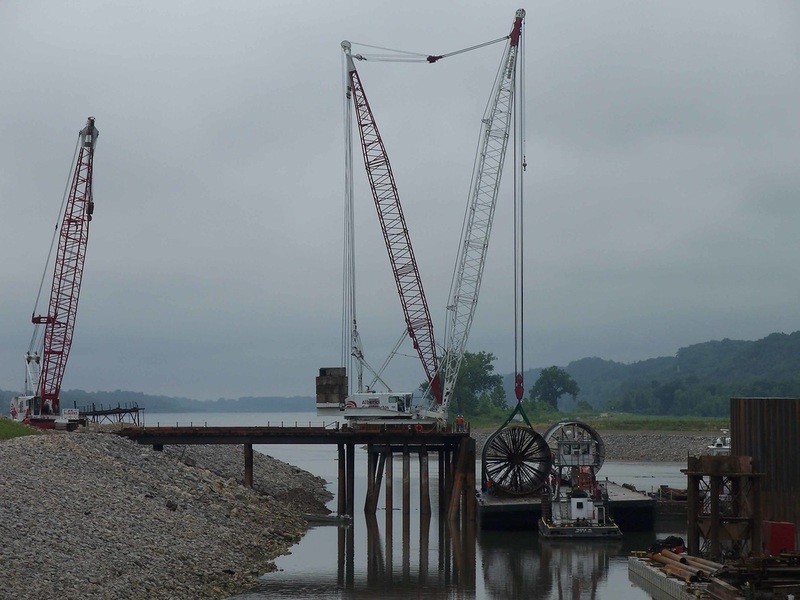 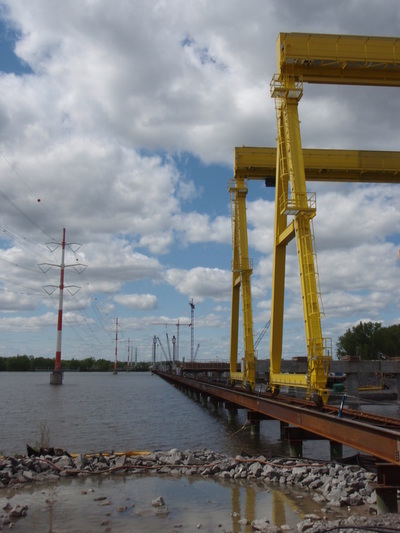 Fender pile groups protected the trestle from barge impact and were designed to handle substantial changes in water and barge elevations. 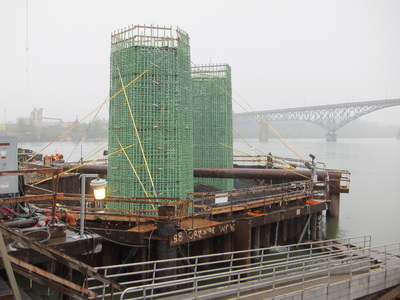 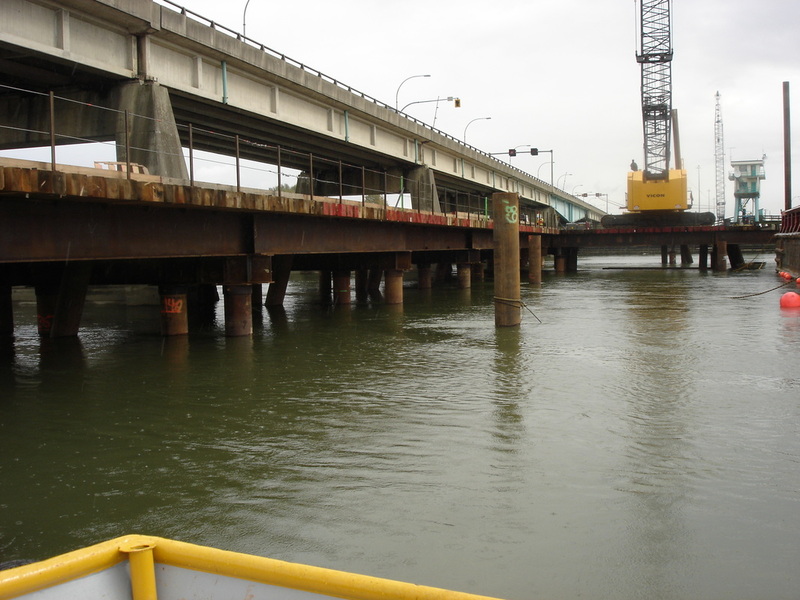 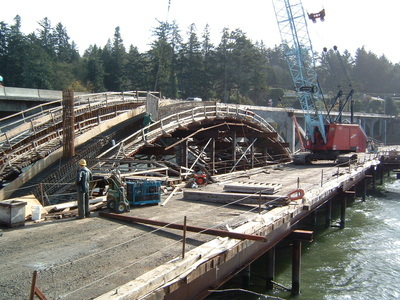 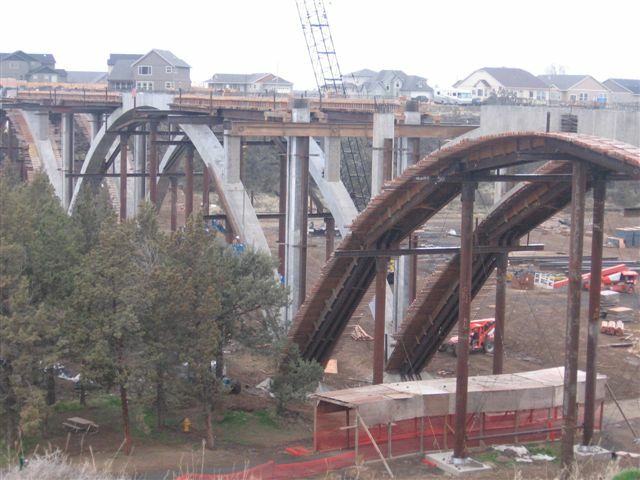 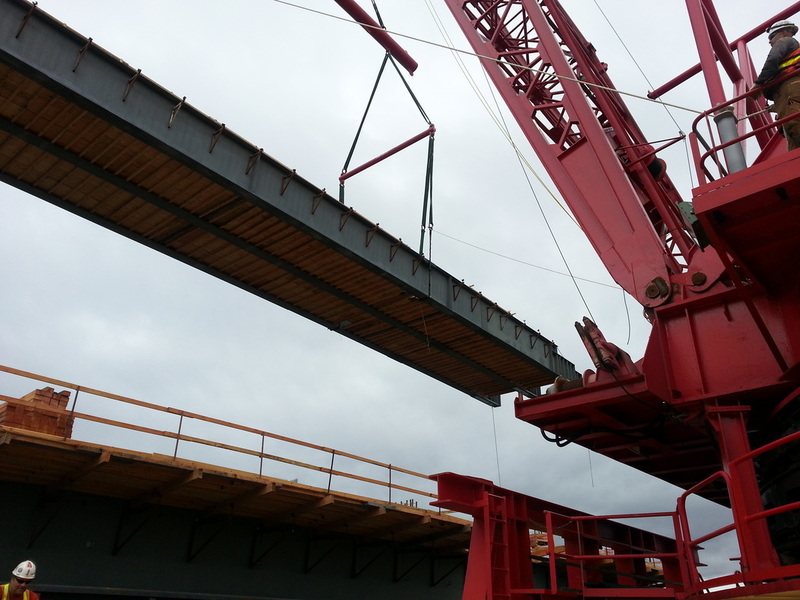 SMG provided the structural design of cofferdams for the Alsea Bay Bridge in Waldport, Oregon. 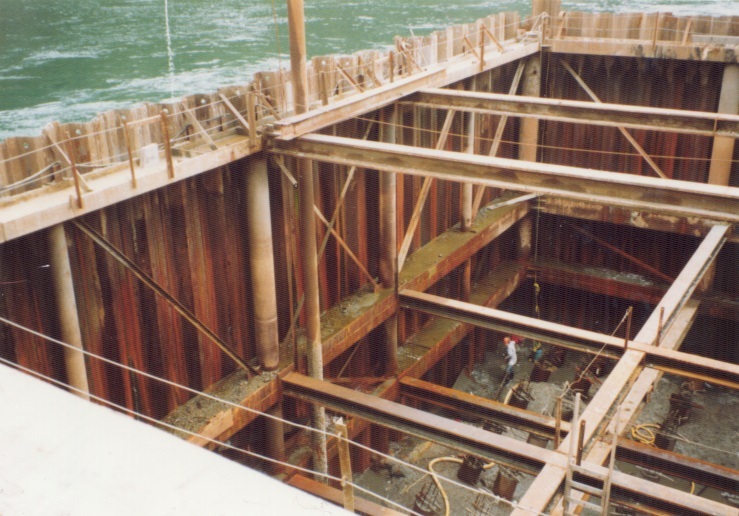 The cofferdams ranged in size, with the largest being 50-feet by 90-feet by 53-feet deep. This project required efficient design to resist the huge loads induced by the water and yet utilize materials readily available to the contractor. 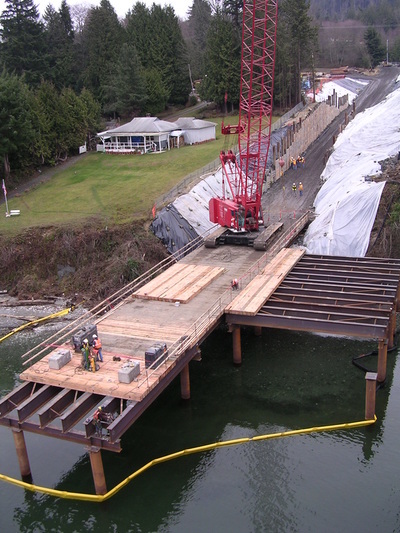 SMG provided construction engineering design services for this bridge project. 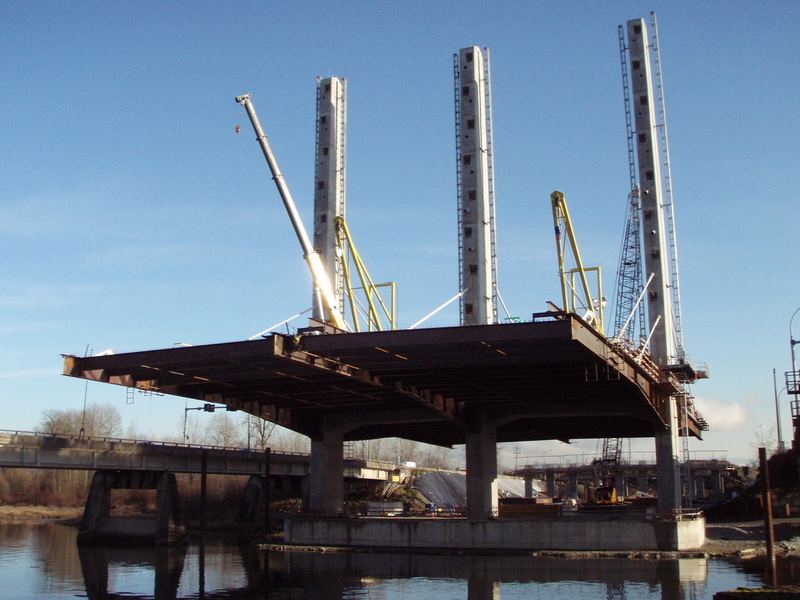 SMG's design services included a crane work bridge, existing bridge demolition, in-water pier cofferdam shoring, landside pier cofferdam shoring, cast-in-place arches and bridge deck falsework. 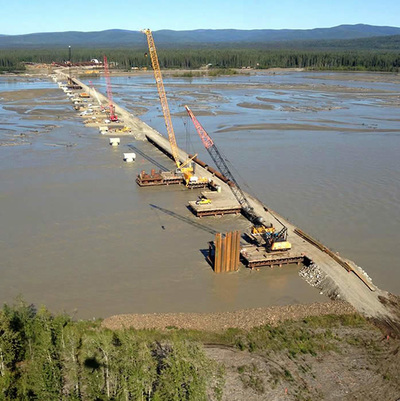 SMG provided construction engineering services for a 35-foot-deep cofferdam design for construction of permanent bridge piers, trestle design to span across the Tanana River and support cranes during bridge construction, and templates for driving piles and installing cofferdams in a fast-moving river. 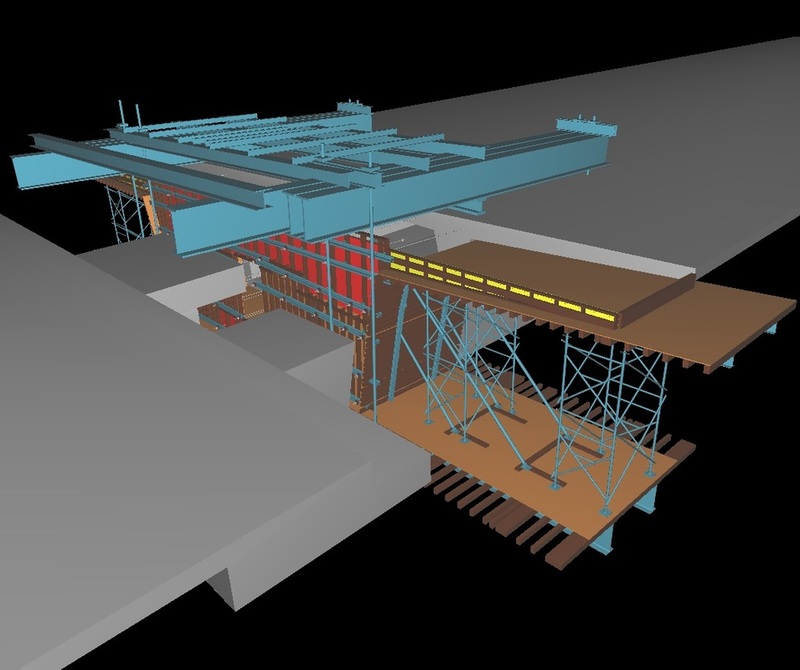 SMG solved several design challenges on this project. Construction continued through the winter, so the structures had to be designed for temperatures as low as minus 30 degrees Fahrenheit. In addition, the construction of a causeway partially across the river narrowed the channel and led to a deeper and faster-moving section of the river than the cofferdams and trestle had been initially designed for.